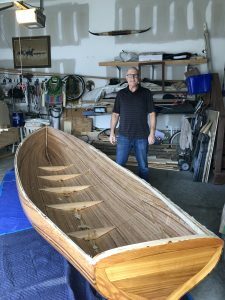 One of my “bucket list” items has always been, “Build a wooden rowboat from scratch”. However, you need many things to accomplish this task. Besides all of the tools necessary to cut and shape wood accurately you also need a place to do the work and above all, THE TIME TO DO IT!! 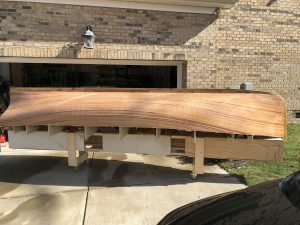 I saw a T shirt once that said, “I have a super power, I can turn wood into a boat!” Follow along with me as I go through building this Glen-L Whitehall and you too can have that super power. My wife has been gifting me various tools over the many years we’ve been married so I’ve accumulated a nice garage full of hand tools and a few power tools as well. The hand tools needed won’t cost an “arm and a leg” and I’ve collected many over the years from garage sales and swap meets including hammers, screwdrivers, sanding blocks, saws and a very useful hand tool for this project, a hand plane. 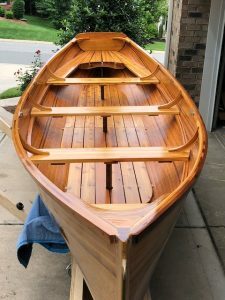 To build a boat like this it is also necessary to have an inexpensive table saw (can be had for less than $200) for cutting the strips for planking and laminating plus another power tool that comes in handy is a jig saw for cutting the molds and various parts that, when assembled, turn a pile of lumber into a boat. 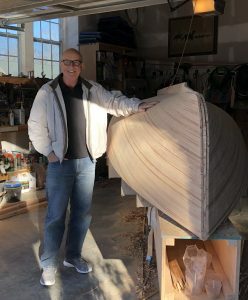 A rowboat can be made without plans by people more skilled than I and it’s possible that I could have made one without professionally designed plans but I didn’t want to end up with a “Nailed It” boat so I purchased detailed plans for building a 17 foot Whitehall rowboat from a business called Glen-L Marine in California. I used to pass their building in Southern California when I would drive down Rosecrans to visit customers in my former life as a regional manager for a tool & die distributor and always told myself that I would someday build one of their designs. 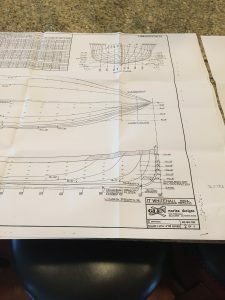 The plans arrived in the mail and I quickly spread them out on a table and was a little intimidated at first but then I saw that the plans also came with a short step by step guide. 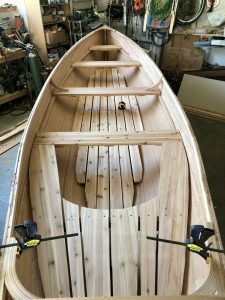 As I read through the steps and found each corresponding drawing I quickly saw that if taken one part at a time, a novice woodworker could build a beautiful, functional boat that a family would enjoy many years. 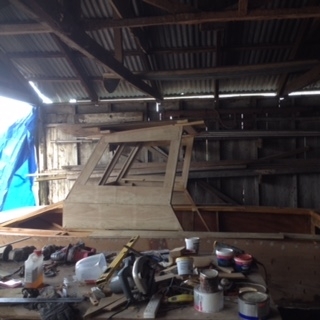 Next step: Build the strong back, the structure on which the boat will be built. This Whitehall will be built upside down by attaching strips of wood planking onto temporary forms. 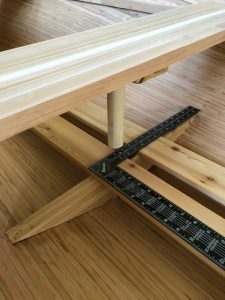 The forms must be mounted onto a strong back which is nothing more than a flat and level table that can support a few hundred pounds. 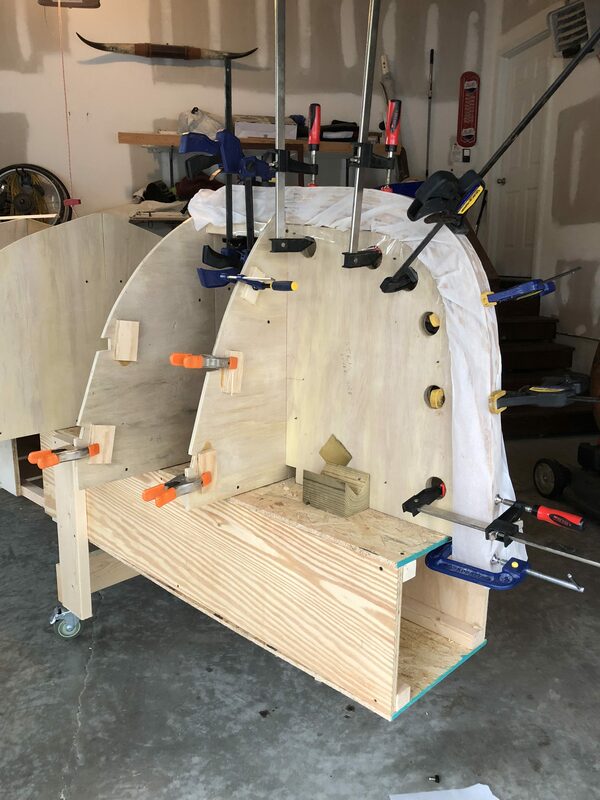 I built the strong back with 1/2″ x 4′ x 8′ sheets of plywood, cut them and nailed them to a 2 x 2 frame and once I had a 16 foot long box I added some legs and casters so I could move it around to work on it. If you have the room it would be preferable to have it permanently set up so you could shim the legs perfectly level. I do not have the room but fortunately my garage floor is very flat so it wasn’t a problem for me to make it mobile! As you can see above I’ve marked a straight centerline by snapping a chalk line lengthwise and then used a carpenter’s square to mark perpendicular lines spaced according to the plans. Each perpendicular line represents a spot where one of the molds will be attached. Here is another shot so you can see the entire structure. 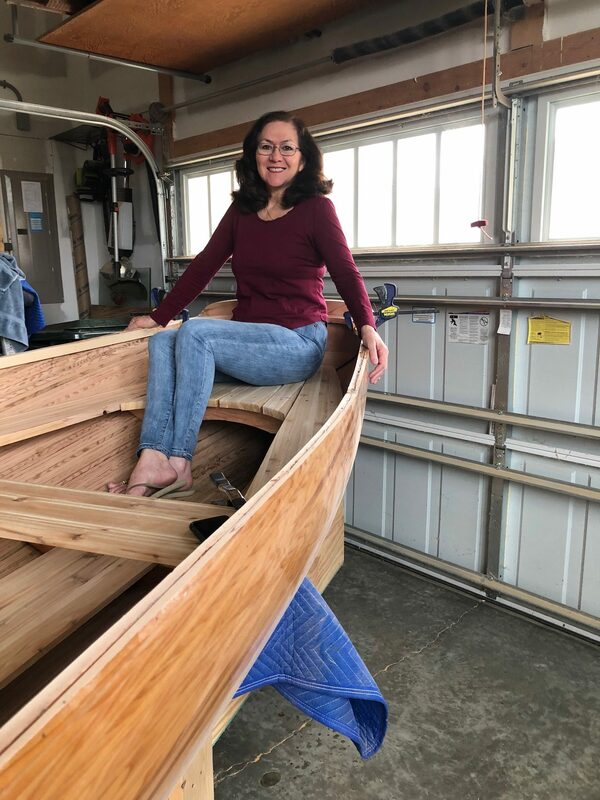 I have a level on top to check it out and I also temporarily set up an upright 2 x 6 that is the same height as the boat forms to make sure I can reach over easily. 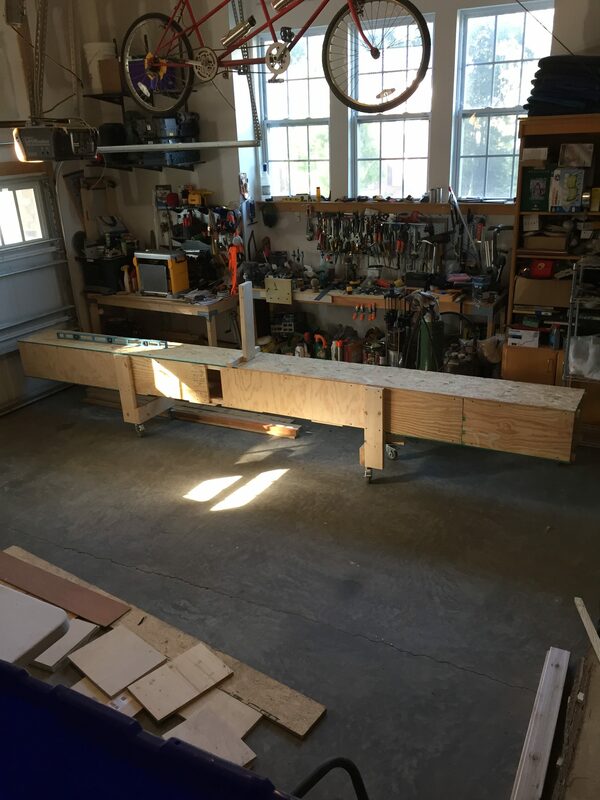 You might be wondering how I’m going to build a 17′ boat on a 16′ table? I don’t have room to work around a 17′ boat so I’m going to proportionately shorten the spacing of the molds so I’ll end up with a 16 foot Whitehall. Hull speed in knots is calculated by taking the square root of the length of the waterline times 1.34 so I’ll be losing very little speed through the water. 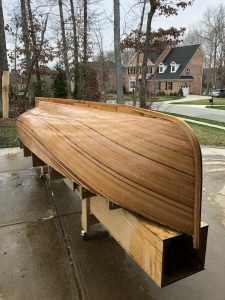 As I’m writing this I’m pretty far along with the boat and I can tell you that this was one of the hardest parts of the job so once this is built you are on your way! Now, how do you transfer the drawing to a piece of plywood to cut the molds? Believe it or not you can still buy carbon paper at the big stationery stores so I purchased a package of 50 sheets for less than $5 and put those down on the plywood then with the drawing on top I carefully traced over the lines using a gel pen so it would glide smoothly. When I lifted the drawing and carbons I had a perfect transfer to the wood and cut along the line with the little jigsaw above. I left a very small amount of wood over the line and then sanded back to it so I’d end up with a smooth surface. After cutting and sanding each mold you will have one half of the complete mold station so you will need to flip it over and trace along your mold ( the half you just made) and repeat the process until you have both halves of each mold for all the stations. 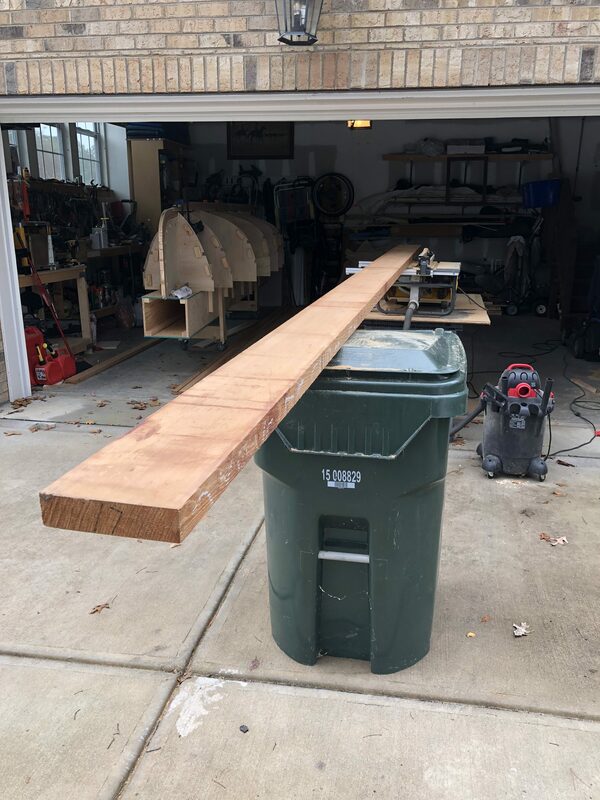 Since the strip planking will eventually fit tightly to the molds it will be necessary to partially destroy them to get the boat free. 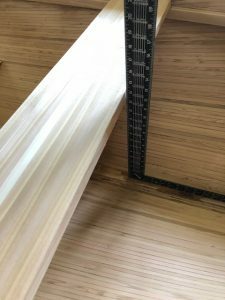 This can be facilitated by butting together your two halves and attaching them to a smaller square of plywood with a few screws so you can pull each half out separately later. In the picture above you will see that I have attached all of the molds to the strong back and I mocked up a strip of wood to get an idea of the shape of the boat. 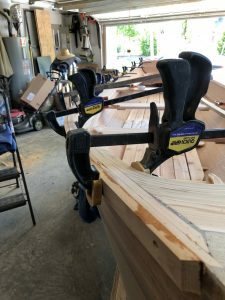 At this stage it’s very important to make sure all of the molds are lined up square and plumb to the strong back to help make constructing the boat easier. It was so much fun to see something already! This was on my third day. 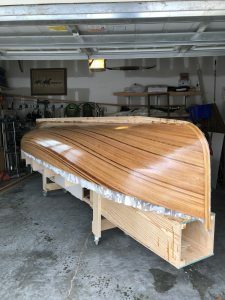 The front of the boat has a laminated stem on the inside which will not only provide a very strong bow but also provides an attachment point for the strip planking. 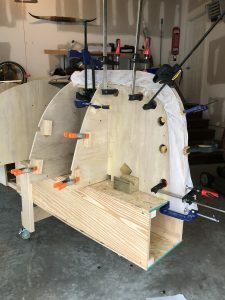 The plans include a stem mold that butts up against the front station mold and has to be placed on the centerline previously marked on the strong back. I drilled several holes in mine so I could use clamps to hold down the thin strips of wood to the form. 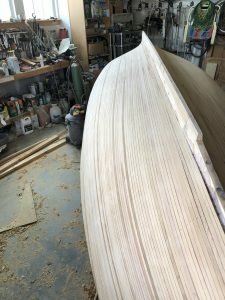 The stem is the continuation of the keel which will be about 3 1/2″ deep so how do you make a two by four piece of wood curve up from the keel? 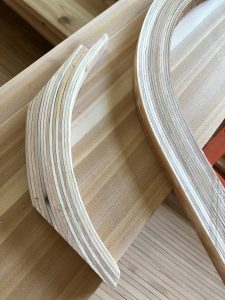 You do this by using glue to laminate enough thin strips of wood until you have a stack about four inches high then you bend them around the form and clamp them in place until it sets up. My stem was laminated using clear epoxy which was then wrapped in ordinary parchment paper. Parchment paper is that stuff people use on a baking sheet to keep cookies from sticking to it and guess what?- Nothing sticks to parchment paper, not even epoxy glue!! After the stem had cured I unwrapped it and attached it to the mold. 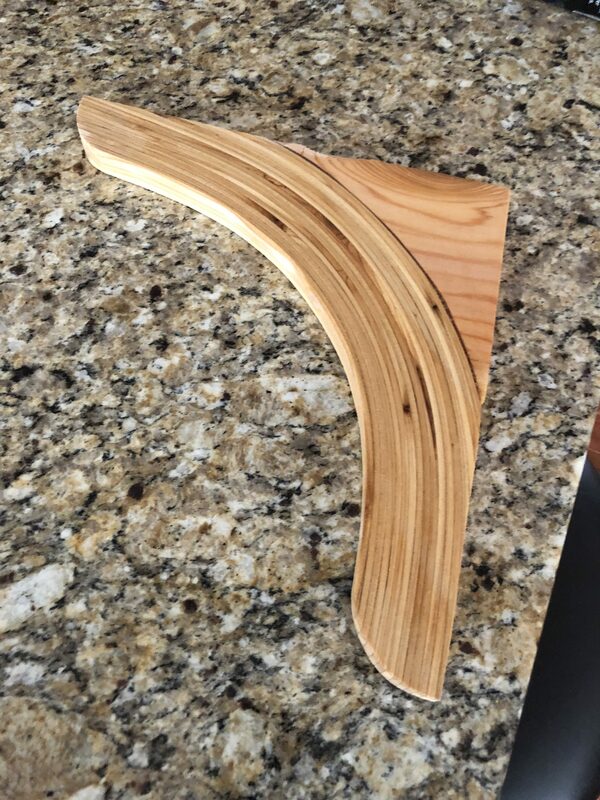 Here is a photo of the laminated strips of wood that were easily bent around the stem form but after curing could probably hold up the house! It’s difficult to see traced lines but the stem needs to be made larger than the final finished part so the proper contours can be cut later. 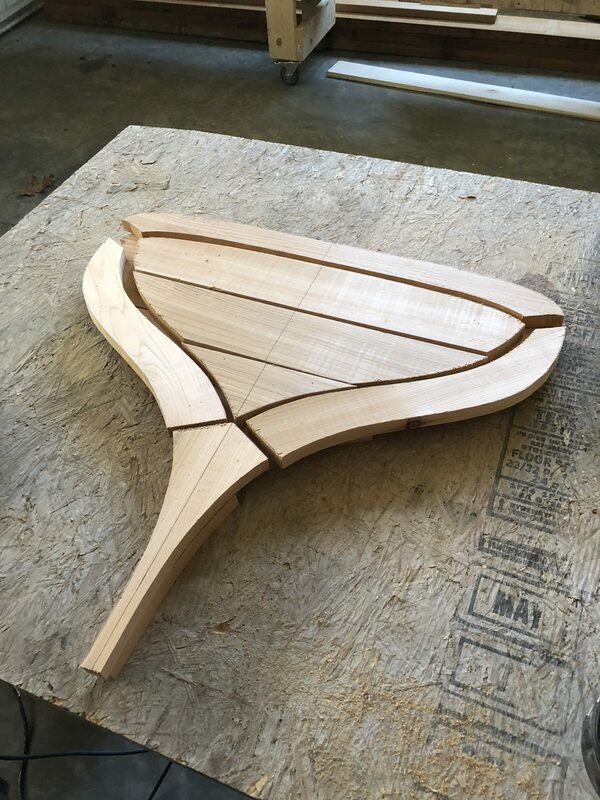 The stem needs to be beveled so that the strips will have a good attachment point when they meet up with the stem. We will mount the laminated stem to the stem mold tomorrow to continue the process of building the Whitehall. 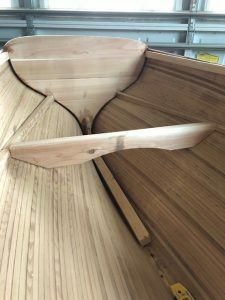 On the last post we talked about the stem that is part of the bow of the Whitehall rowboat. Today we’re going to take a look at how the transom is built for the stern (back) of the boat. 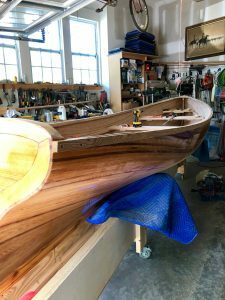 You can see from the picture that the transom is made up of several parts and in two layers. The outside of the transom is what you see above and what you don’t see are the alternating layers that make up the inside. The transom is made up of a double thickness of 3/4″ boards to end up with an overall thickness of 1 1/2″. This is strong enough for a trolling motor to be attached. 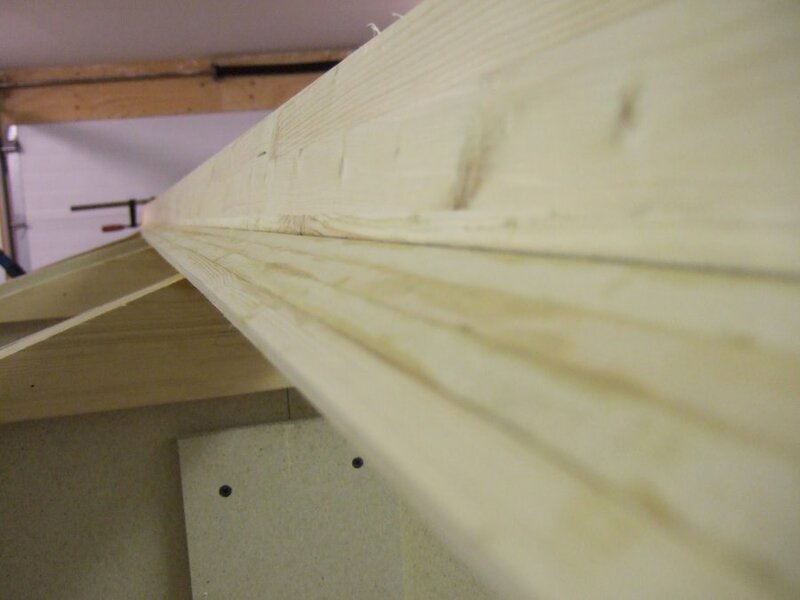 The inside and outside layers overlap in a way that no joints line up to eliminate water ingress. Here we have the transom mounted and it becomes the rear attachment point for the wood strips to come. 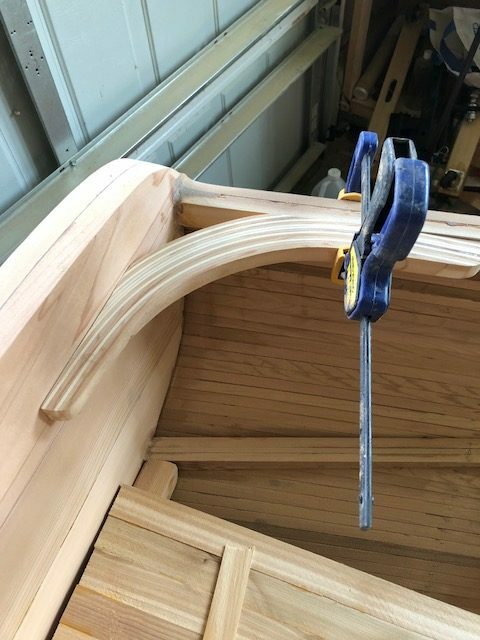 You can see that according to the plans the transom does not sit right on the strong back like the station molds because the strips will not go all the way to the strong back table top, only to that sheer plank you see clamped to the transom. 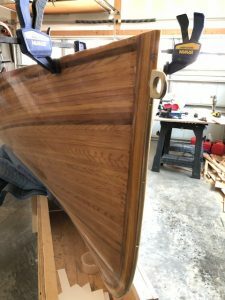 At the bottom of the transom (which is at the top of the picture) you will see that I made another laminated part called a “knee” that connects the transom solidly to the keel. 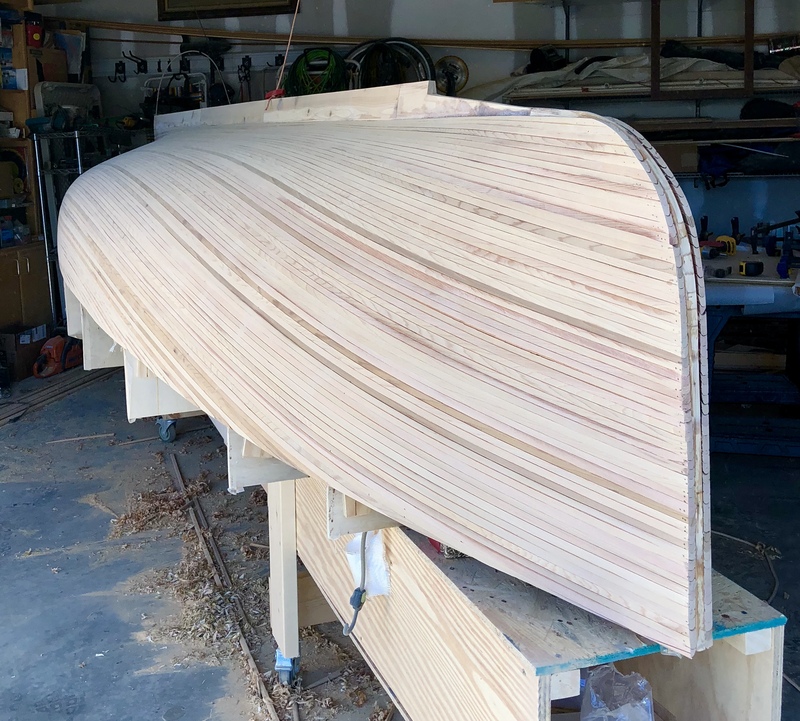 Here is another shot of the transom to keel connection and you can see how the knee helps keep everything lined up properly (it’s not a 90 degree angle but don’t worry, it’s also in the plans) and very nicely screwed and epoxied together. 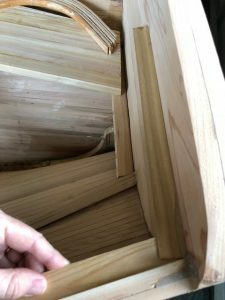 If you look closely you can also see the layers of wood for the inside of the transom don’t match the outside which adds strength. PART 6: DON’T KEEL OVER! The keel joins the laminated stem at the front and the transom at the back plus it ties into the floor supports. The floorboard supports sit on the keel and follow the outline of the station molds so that as strips of wood are added they also glue to the supports to make a rigid structure that will hold the weight of people stepping on the floor of the boat. 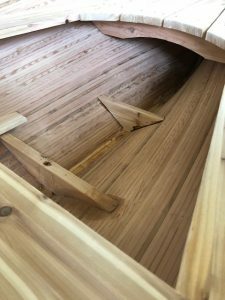 You can see that the keel and floorboard supports are made of a different wood from the station molds because it’s better to use a type of wood that resists rot. 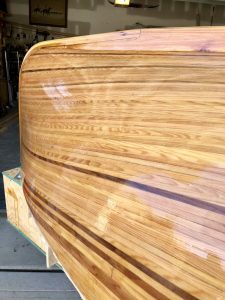 Even if your boat will be coated in epoxy and fiberglass cloth, water will get in so rot resistant wood is an additional precaution. 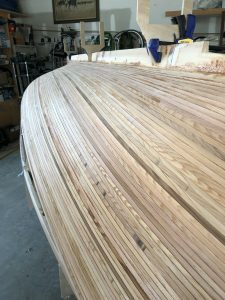 I’m using western red cedar for this boat but there are other choices out there depending on the look you’d like to achieve. The keel has a taper which is easy to cut along the length using the table saw’s ability to tilt the blade for long beveled cuts and with some sanding to remove the saw marks it wasn’t a big project to get ready. Here is a look at the basic assembly of the front stem mated to the keel, floorboard supports and at the stern of course, the transom. You’ll notice the laminated front stem has been notched so the keel has plenty of surface area for gluing and fastening with stainless bolts. There is an additional notch at the outside front of the keel that will eventually be filled in by the outer stem. More on that later. I’ve also added both the sheer and the risers. The sheers will eventually mark the top edge of the hull and they temporarily fasten to the transom at the back and attach to the stem at the front with a tapered edge to make kind of a point going forward. The riser attaches at the transom in the back but ends before getting all the way to the stem. 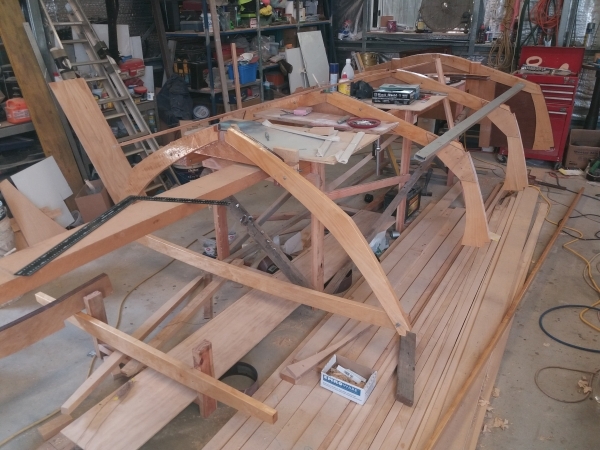 After the hull is finished it will be turned over and the riser becomes the base for placing the seats otherwise known as the “thwarts”. 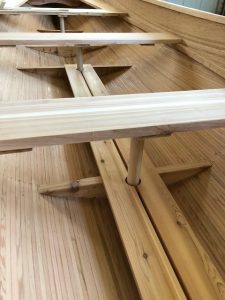 The seats do two things, one is they provide a place for the rowers to sit and secondly they “thwart” the sides of the boat from pushing in under pressure from the water!! The stem has been mated to the keel and has bevels shaped into it to meet up nicely with the cedar strips when we start planking. 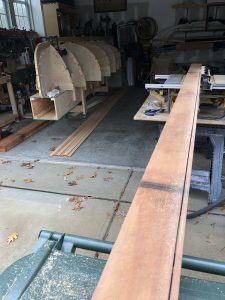 On top of the keel I made some cedar strip “holders” to have a handy place to quickly get additional strips when the planking gets going. We are ready to PLANK but we are missing something. We need to make the STRIPS!! First of all let me say, this was a LOT of work that took days to complete but I’m glad I did it. Commercially made strips are available from mills so if you want to skip this step just go and buy them but be prepared to get your wallet out!! 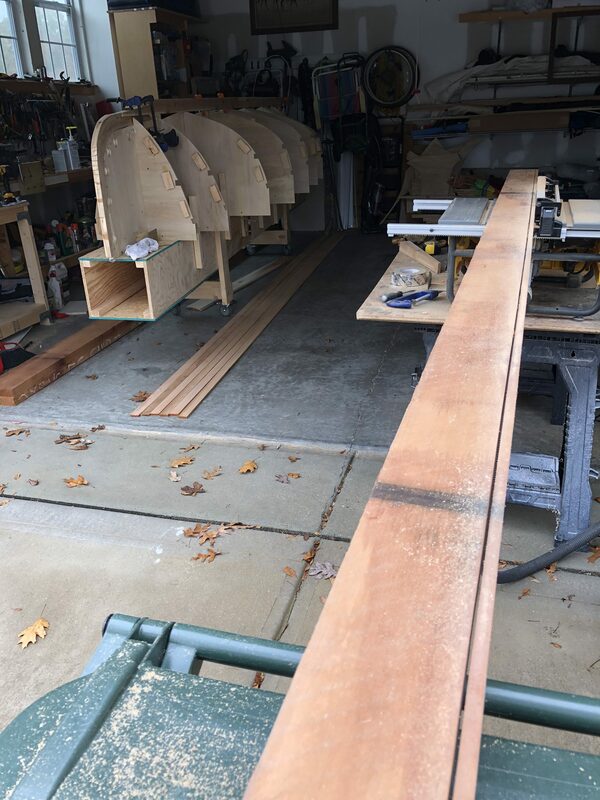 It’s hard to believe that a few of those boards above will be a boat in a few months but that is the beauty of woodworking and it’s so much fun! Thank goodness my recycling container was the exact height I needed for an extension table. These big boards were 17′ long so it would have been awkward without something to take the weight as I pushed them through the saw. 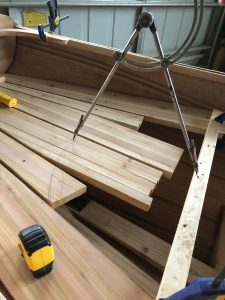 BTW, even though most table saws use a 10″ blade I chose to switch over to a 7″ circular saw blade because they are only about 1/16″ wide vs nearly a tenth of an inch for the big blade. It might not seem like much but saving 1/32″ on every cut saves a lot of wood in the long run. 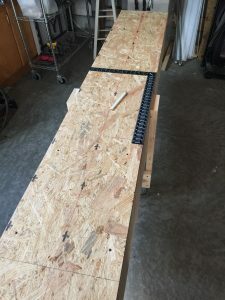 I cut my blanks for the strips a little under 1/2″ for thickness and about 5/8″ for width (.430″ x .620″ for my tool & die friends) and all 17 feet long. They were a bit cumbersome to handle but my little rack I made kept them up and out of the way. 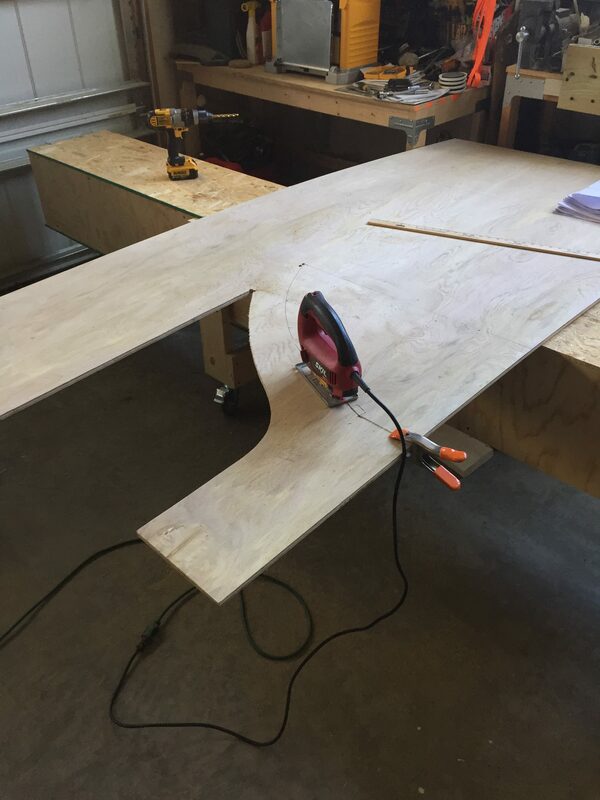 Another must have tool if you’re going to cut your own strips is a router and a router table. I received this as a Christmas gift a few years ago because my wife wanted me to make toys for the kids and now I’m finally getting around to using it for my big toy–the boat. As you can see above I have a router blade that cuts both the bead and the cove into the blanks I previously made however, it doesn’t do both at the same time. 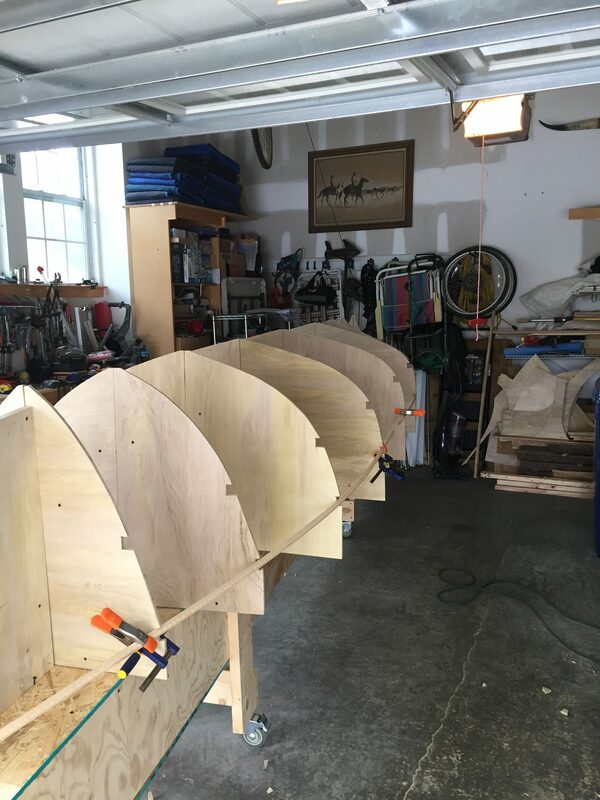 I have to set it up for the bead and run all the boards then set it up for the cove and run them all again. The bead and cove strips fit together pretty well and it allows for curving over the station molds as well. 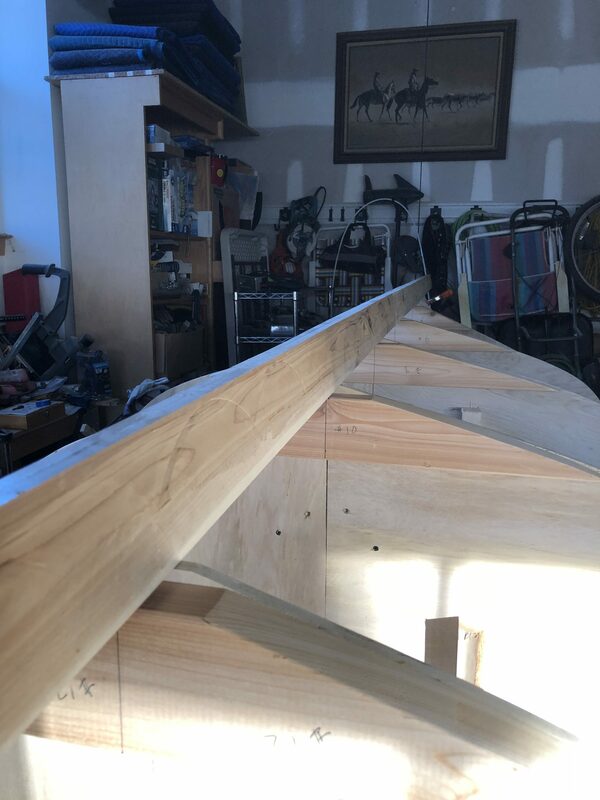 The plans call for 1/2″ thick strips but I know that my boat will not need as much wood removed through planing and sanding because I’m being careful with the finish on the strips plus it will end up pretty smooth when it’s all planked. My strips are about 1/16″ thinner than 1/2″. 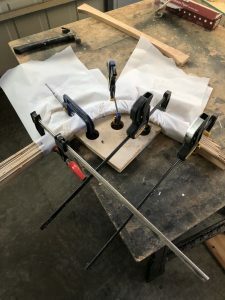 Next step–get the molds ready for covering with glued strips. Fairing a boat’s hull is what we do to make sure that the boat is as smooth as possible to minimize turbulence while moving through the water. 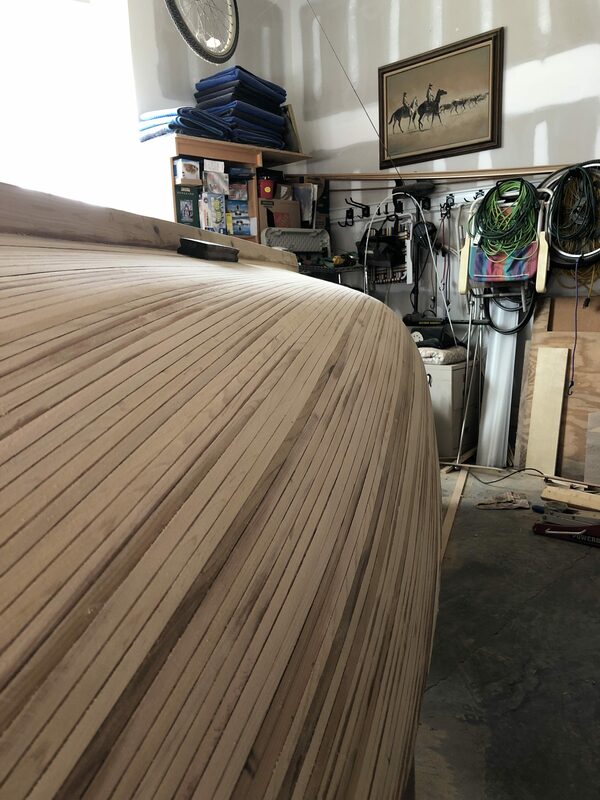 In order to make it easier to accomplish this after planking we need to make sure the form will not introduce any “bumps” to the hull as we bend the strips over it. 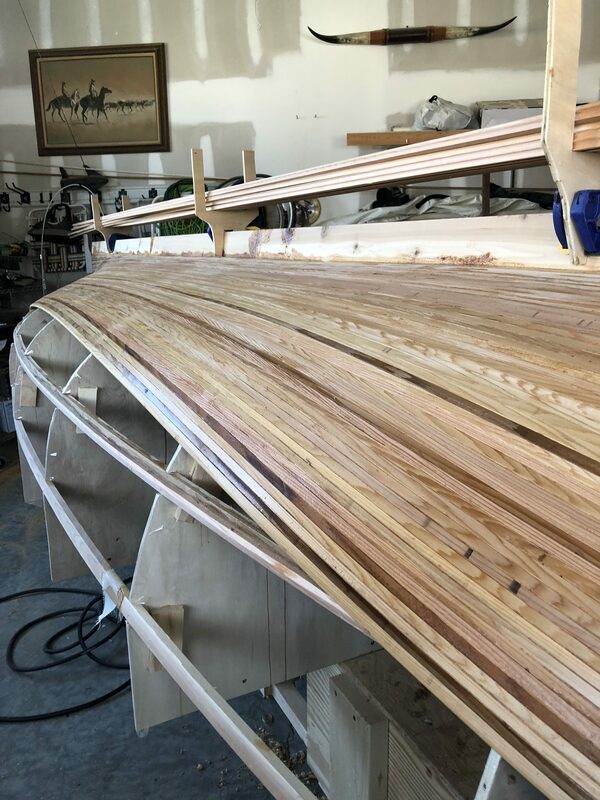 With all the station forms carefully aligned and the transom, keel and stem perfectly centered there will nonetheless, be places on the form that will cause the strips to go in directions that won’t produce a fair hull. 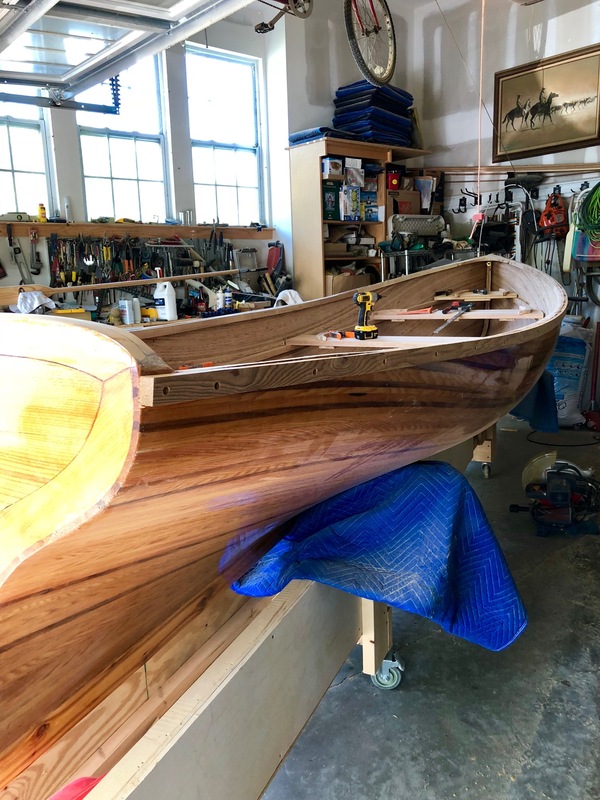 If you look closely at the form above I’ve already started tapering the the front stem so the cedar strips will converge to a point plus this is done to give a larger surface for the stem to strip connection. 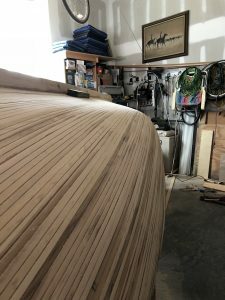 The angle for this fairing of the form was found by taking a long batten (any bendable thin strip of wood) and temporarily clamping it in place along the forms to visualize what the natural smooth curve should look like. 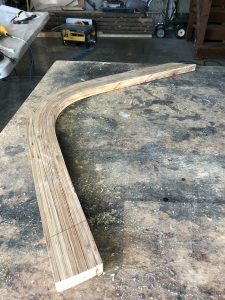 If you see anything causing the batten to deviate from a nice curve then it must be ground away just enough to keep a smooth curve but not so low that the strip won’t stick to it during the gluing process. Preparing the form in this way must be done carefully. It took some time because I knew I would be using slightly thinner strips than the plans call for so I wouldn’t have a lot of room for error later. BTW, you’ll also notice I’ve put packing tape along the edges of the station forms so the glue will not stick to them and it will be easier to separate the hull when it comes time to flip it over and start on the interior. 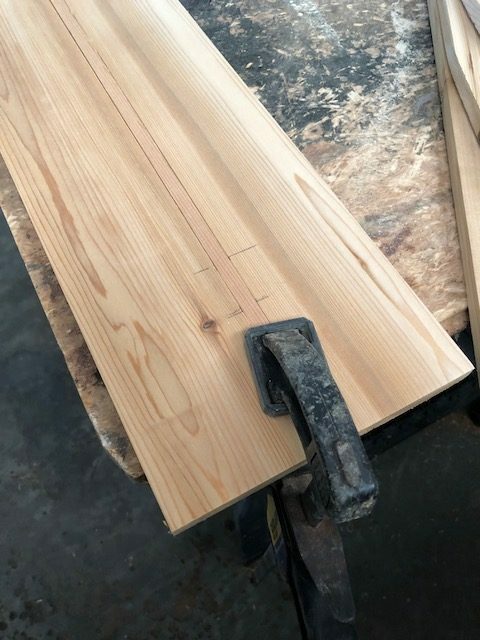 The little blocks you see glued to the forms are in case it becomes necessary to clamp onto something while applying the strips. Once you’re satisfied that the form is in “ship shape” (literally) then it’s time to start planking! If you thought it was fun already wait and see how much fun it will be to actually start seeing the boat take shape over the next few days. One last important thing! Take a look at your form and its bracing to see if there are any screws you will not be able to unfasten after the form is covered with strips. 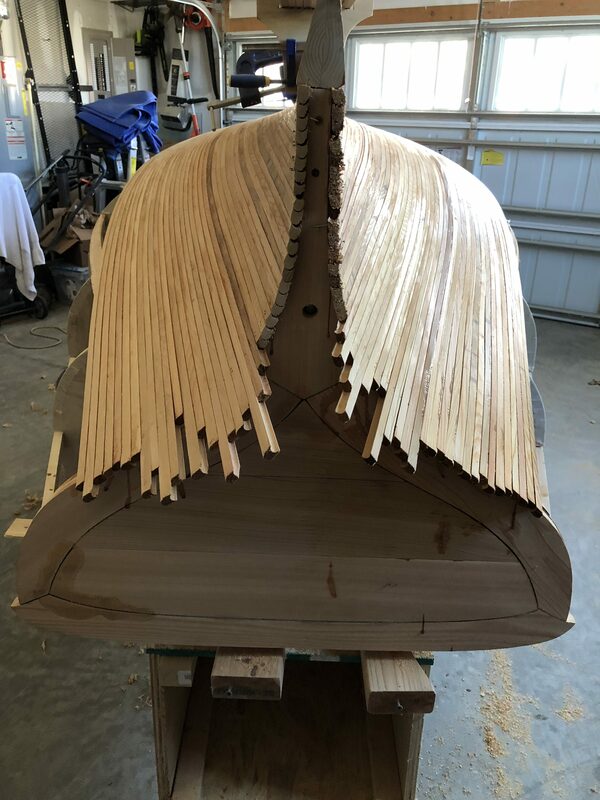 Every screw holding down the forms and thus the boat hull itself will need to be removed when it comes time to flip the boat over. The first strips begin at the keel and though it’s difficult to see, the keel has been beveled so the strips make a solid, flat contact and don’t just meet at a corner. The first two strips against the keel only had the bead and not the cove so as to make a solid connection. 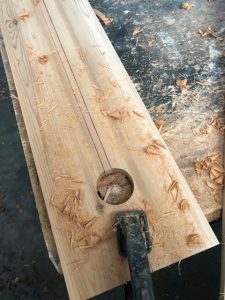 I chose to have the bead down as I added strips so I could tap on the strip with a mallet if necessary without damaging the thin edges of the cove if I had oriented them the other way. 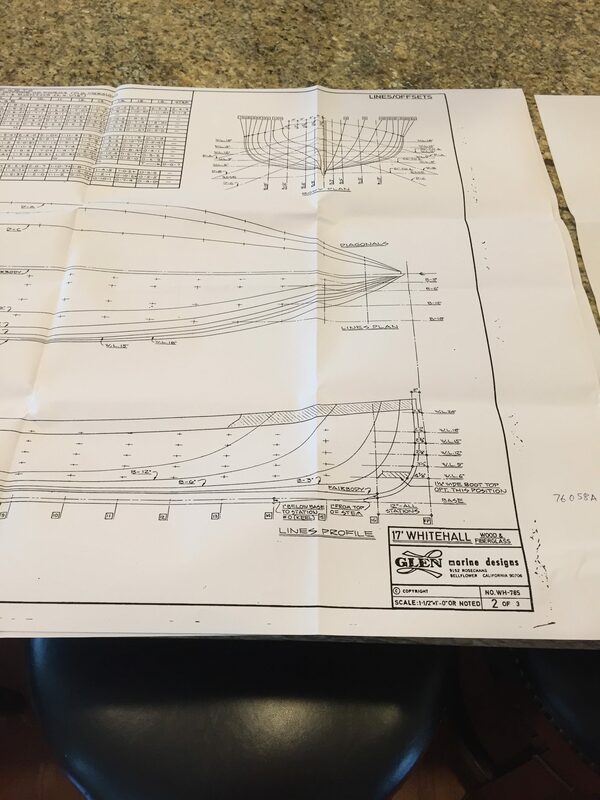 Although the plans call for starting at the keel I’ve seen others who have chosen to put several rows of straight strips along the sheer and then worked their way up to that point from the keel. 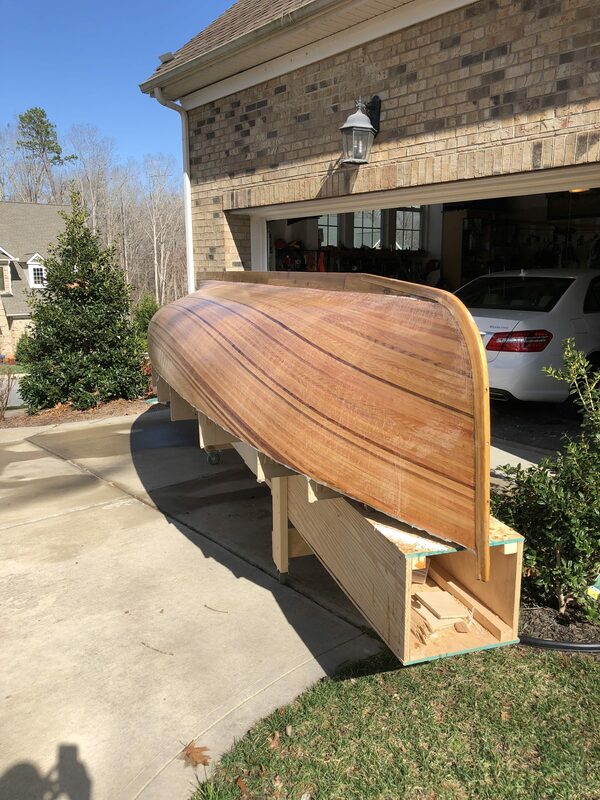 It’s up to individual taste but this being my first try at building a boat, I’m sticking to the Glen-L plans. In this picture you’ll notice two things. The strips are applied with no concern for them lining up with the end of the stem or the transom at the back. It’s much easier to just trim them all later and sand back to an aesthetically pleasing termination. 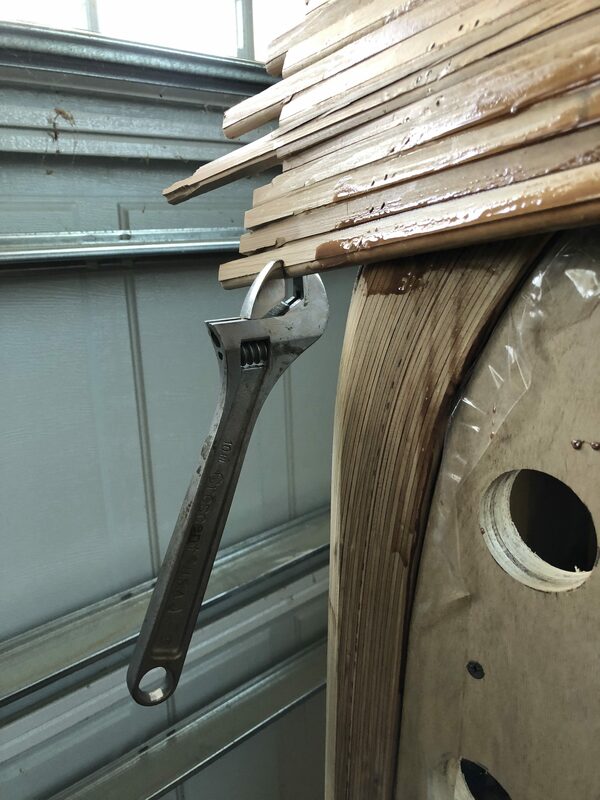 The other thing is the use of an adjustable wrench (crescent wrench) to twist the strips. Look back at the first photo and see how the strips are nearly parallel with the floor in the middle of the boat and then at this photo where they’ve twisted nearly 90 degrees to attach to the stem. Using the wrench turns this into an easy operation since you can easily twist the strips into place as you nail them together. I only needed the wrench for the first rows and once I got about halfway down the sides the bend necessary to attach to the previous strip wasn’t so great and could be done by hand. 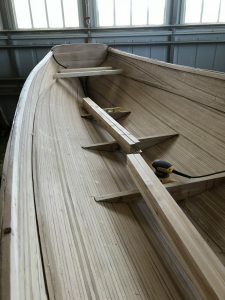 Each batch of strips was put on the boat by first applying a thin layer of glue all along the previously attached strip then I chose a new strip from the rack and centered it on the middle of the forms making sure that the strip would have sufficient length on each end to cover the stem and transom. 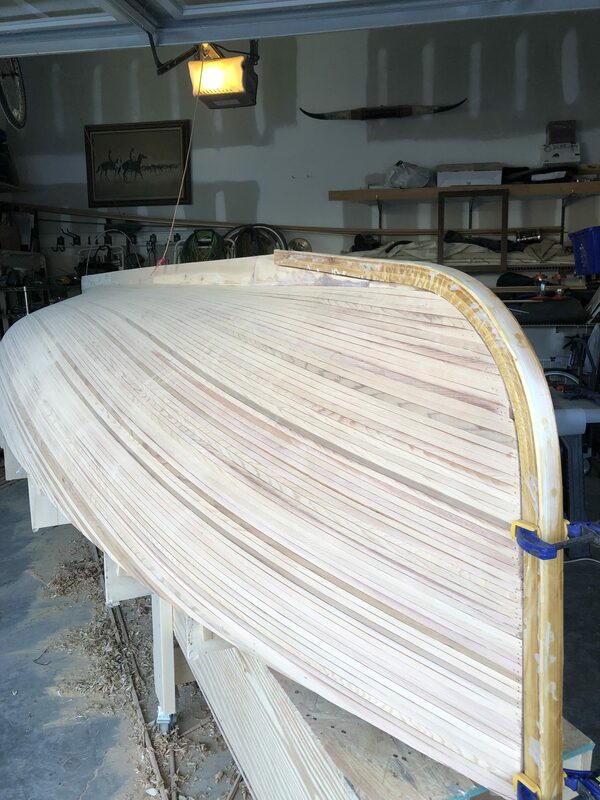 I would then attach the strip at the middle of the forms and work my way to the ends of the boat. Each strip has to be tight up against the previous one so a bit of tapping with a rubber mallet was sometimes necessary. Part 10: Stripping the Hull…But, What Glue? That brown stuff you see me brushing on the cedar strips is called plastic resin glue. 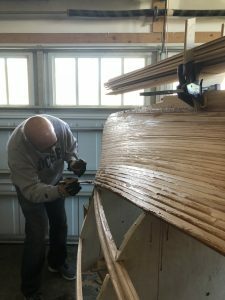 In my research I found that many types of glues have been used to join the strips on these boats. 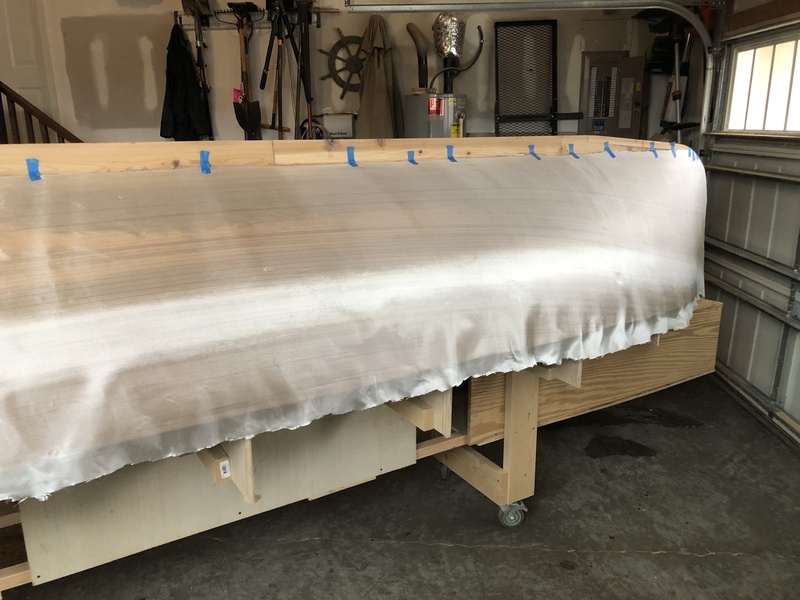 However, since the fiberglass cloth with epoxy will be covering the whole thing it’s really only being used to hold the boat together until then. At first I thought I would use epoxy for stripping but then I remembered how difficult it is to sand it off later. If you have a spot of epoxy glue on a soft wood like cedar you will nearly always sand off a lot of the surrounding wood while you’re trying to smooth the epoxy causing a wavy appearance to the boat hull. 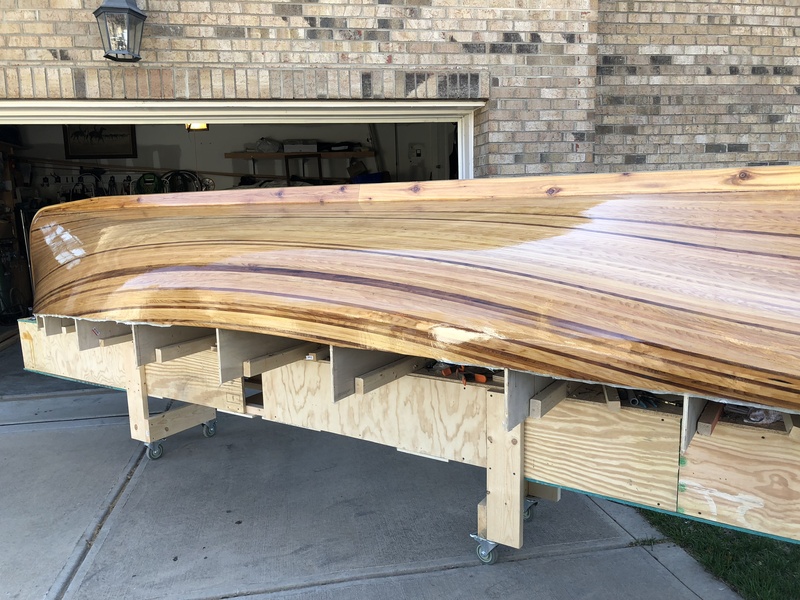 Some people have used those yellow wood glues to bond the strips together and there is the thought that it’s not a good idea because it’s not very compatible with epoxy adhesive but I don’t think it would be that much of a problem since once the hull is faired the glue joints are nearly gone. 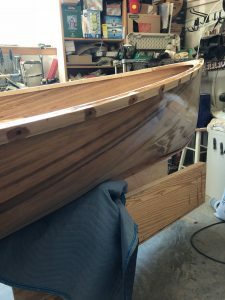 I have even heard of a guy who used a hot glue gun to put his boat together but I decided to use the Weld brand Plastic Resin. This glue is stronger than the wood it’s holding together, brushes on easily and dries in a few hours. Clean up is with water (before it dries) and once it’s dry it sands like wood and looks like wood too! Plastic Resin Glue comes in a tub and is a dry powder with a consistency similar to powdered sugar. I used a plastic cup and added water to a small amount and it had a pot life of about thirty minutes which was enough time to add about 7-8 strips at a time. I got pretty good at edge nailing the strips to the previous strip which hides the nail head between the strips. 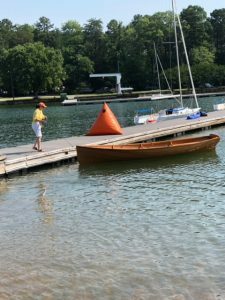 However, every once in a while I would miss the angle and a nail would end up protruding inside the boat which needed to be removed once the boat was flipped over. As you can see the strips are stiff enough to hang out quite a ways but bend nicely to the form. 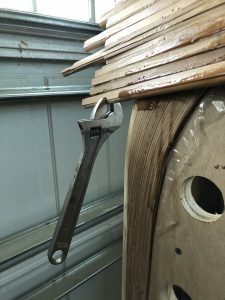 The motion you use as you’re nailing is to bend it slightly to align it then push the strip flush up against the previous one, (giving it a tap if necessary) then finally nail up through to the edge. Repeat! Part 11: Stripping Nearly Done! 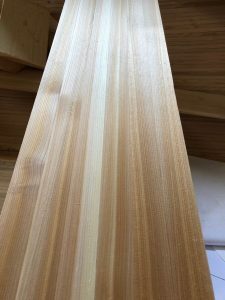 One of the most remarkable things about using cedar for my strips was the variation in colors from one single piece of lumber. When I bought the big 17 foot cedar boards they were a uniform reddish brown color and I’ve seen boats online that looked as if they were stained because the color of the wood was so homogeneously boring. Thankfully as I was cutting the strips I saw that many times the strips would not only be a different shade but sometimes even on the same strip! As you can see above the strips run from nearly white to ebony with many shades in between including pinks. At this stage I hadn’t started sanding yet so I wasn’t sure how much of that color was just on the surface and would last. 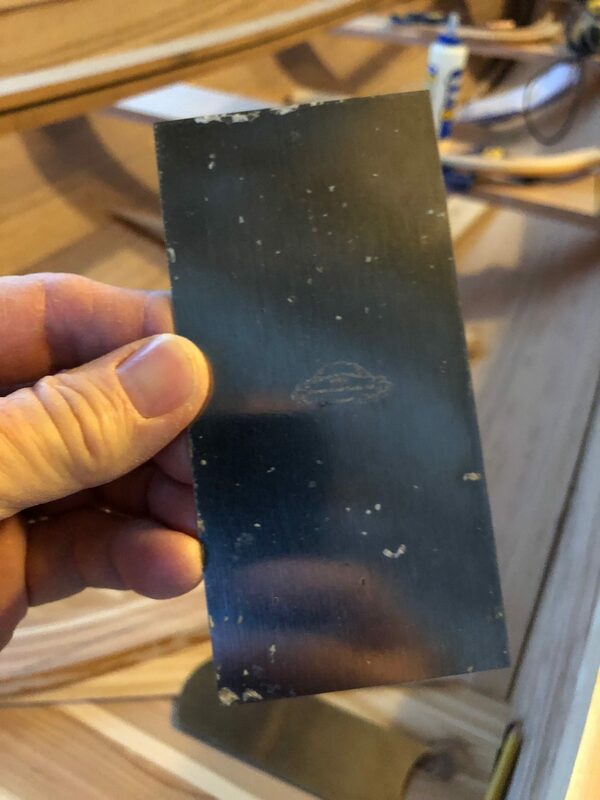 As you can see there are some black rubber spots where the planer I used stopped on the board for a second but those will all be sanded off in the coming days. Here’s a picture of the stern so you can see how a 17 foot strip just made it to cover a 16 foot boat. This was the closest it got and as I proceeded down to the shear they were plenty long. At the front I had to trim them as I went because they would otherwise cross the centerline and hit just beyond the stem. 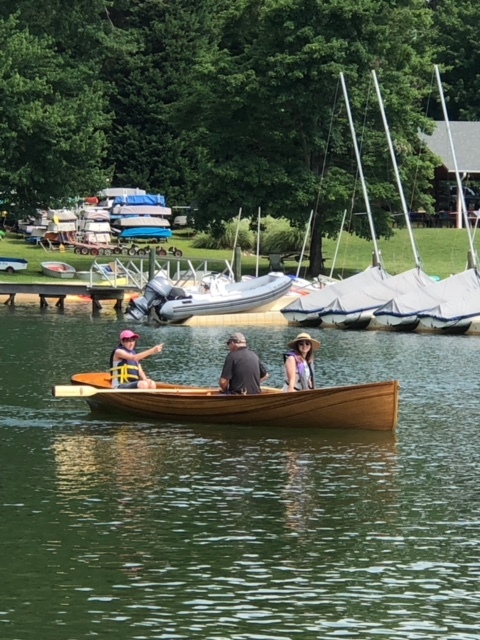 I like how the Whitehalls have a nice plumb bow which gives the boat a maximum length at the water line for improved speed through the water. 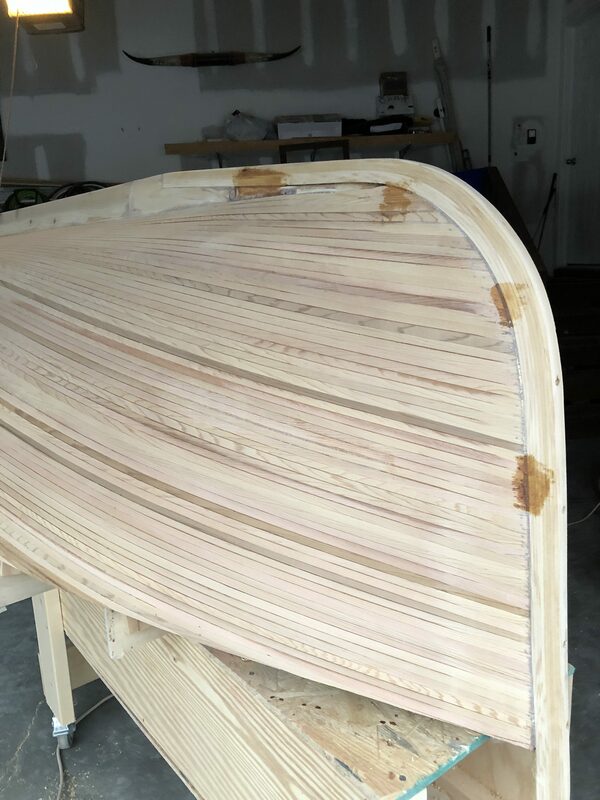 The hull has been completely planked with cedar strips and is ready for fairing which is done with a combination of planing and sanding. 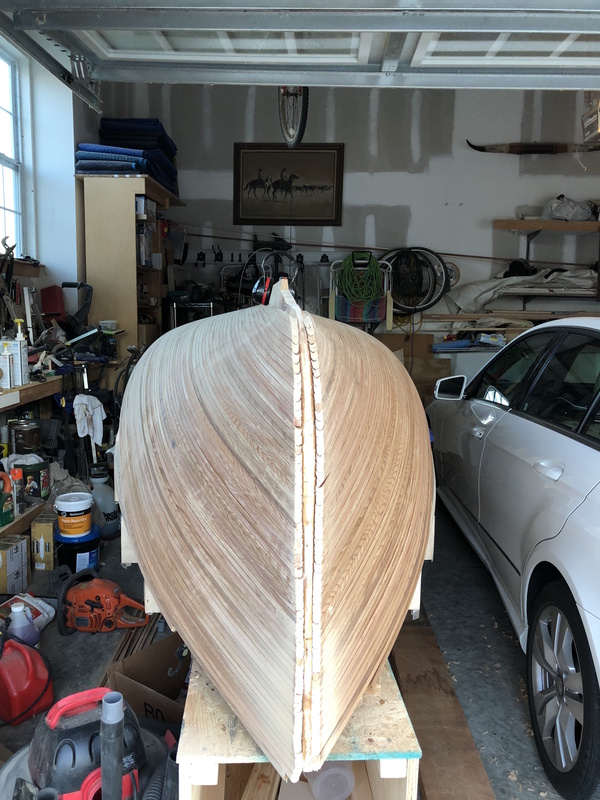 As you can see the hull is pretty good already but if you were to run your hand over it at this point you would find a few areas that need fairing. Here is another view that shows the graceful curve of the hull and a bit of hand planing has been done with a real light run over the hull with an orbital sander. I took care to keep the sander moving and not let the edge of the sandpaper dig in anywhere. At this point I stood back and took a look at the hull from many angles and made note of places that needed more work. See that black thing sitting on top of the hull? That’s a long sanding block which was very useful for smoothing uneven areas. 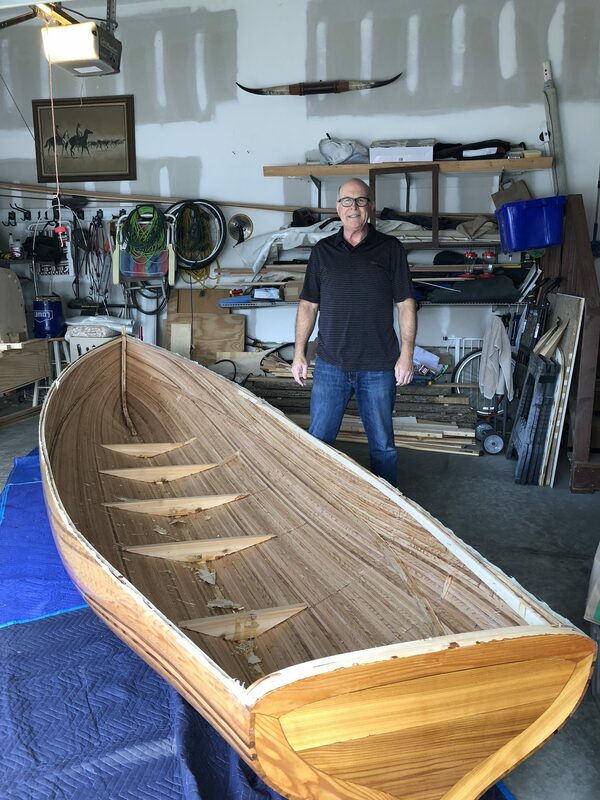 I put a 60 grit sandpaper on it and carefully sanded diagonally across the strips in both directions until I could no longer feel anything but smooth rowboat. This was the most time consuming part of the job and I spent over a week doing this off and on until my arms would give out then I’d rest and start again. 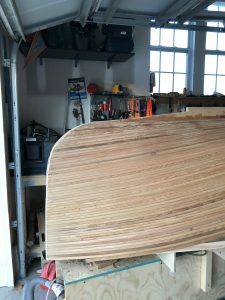 Once that was done I went back over it with the orbital sander loaded up with 220 grit paper until I had a smooth hull. Check it out below. Part 13: We’re missing something! We need to add an outer stem! See that notch in the keel? 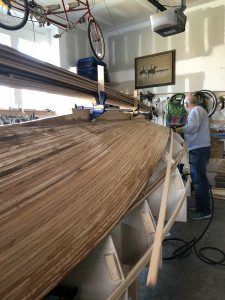 That’s where the outer stem fits against the keel and follows down the inner stem to the top (remember it’s upside down) of the boat. The outer stem, just like the inner stem, is made by laminating strips of cedar and then bending them around a form that matches the inner stem perfectly. 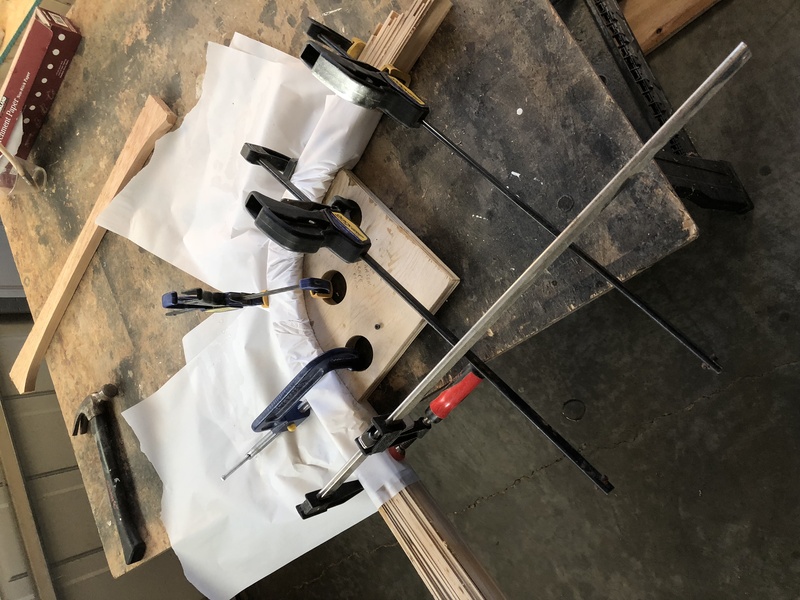 In the photo below I set it in place to see how everything lines up and the next step is to use epoxy glue and 1/4″ stainless bolts to fasten it permanently to the keel and inner stem. 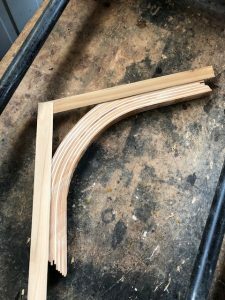 In the next picture I have the front stem attached and it’s been shaped to come almost to a knife edge except that I’ve left a flat where a half oval brass molding will be added. I used a countersink to put the stainless bolts slightly below the surface and filled them back in with epoxy mixed with wood flour. 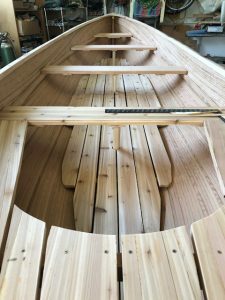 Wood flour (from sanding the hull) was mixed with epoxy until it was about the consistency of peanut butter and filled in the holes. I also used some of the epoxy/wood flour to fill in a few low spots and faired it back later. 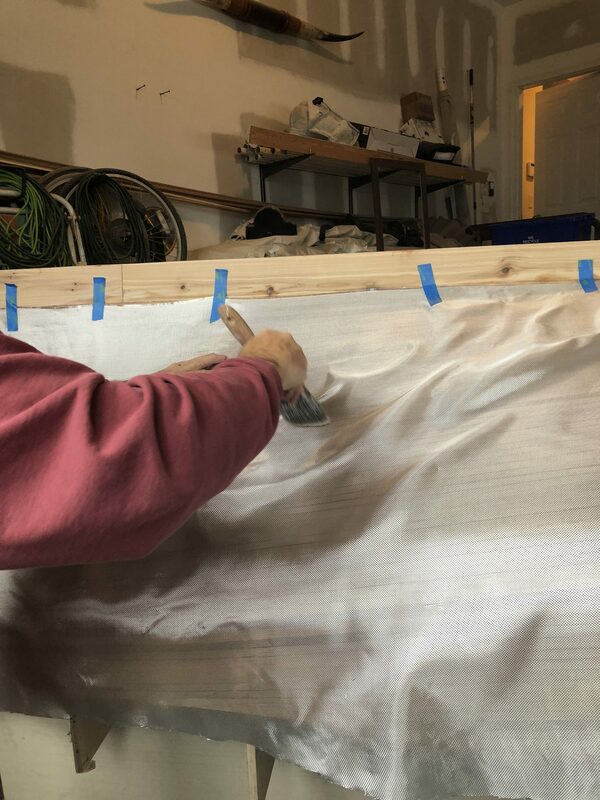 At first glance it seems a shame to cover up that beautiful wood with anything but don’t worry, that 6 oz cloth will practically disappear when we cover it with epoxy resin. Originally, Whitehalls were painted white with a colored strip along the shear of the boat but I’ve decided to leave mine with a natural finish. 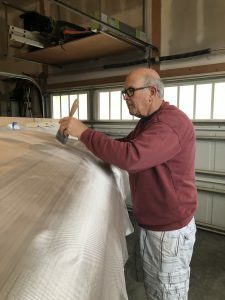 The cloth comes in a big roll and it will have a few wrinkles as it is spread onto the boat so it will need to be brushed smooth as you see in the next photo. It’s a mess at first but eventually with enough brushing it will get like this below. Sometimes you will have a hard wrinkle in the cloth but you can usually get them to go away by using a circular motion on the weave. BTW, the first picture at the top of the page is after the brushing is done and the cloth has been allowed to sit overnight. 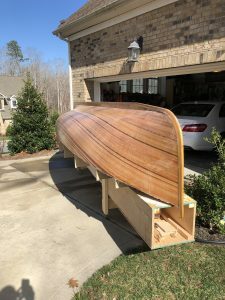 I had originally planned to lay the cloth over the keel but after doing some research on other builds that’s not the best way to go. 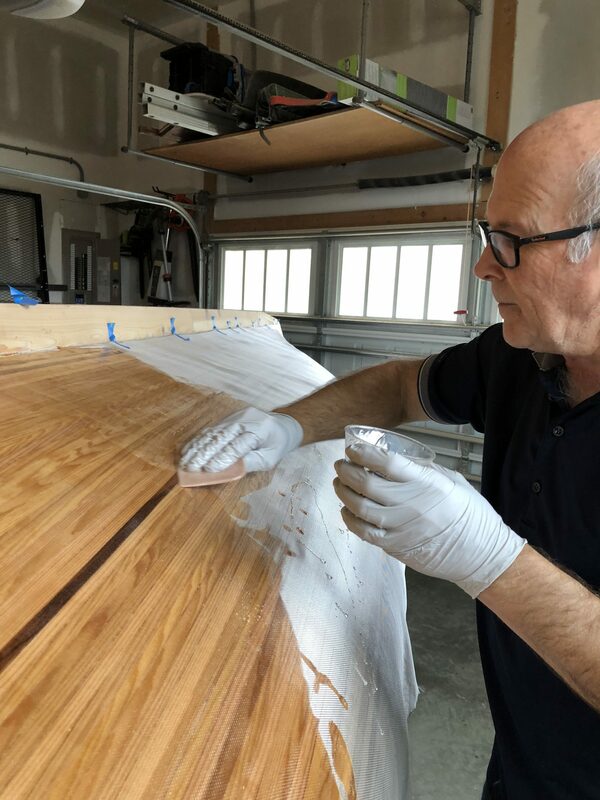 There is a lot of tugging on the cloth once it’s in place with resin on it and the cloth ends up pulling away from that right angle where the keel meets up with the planking. 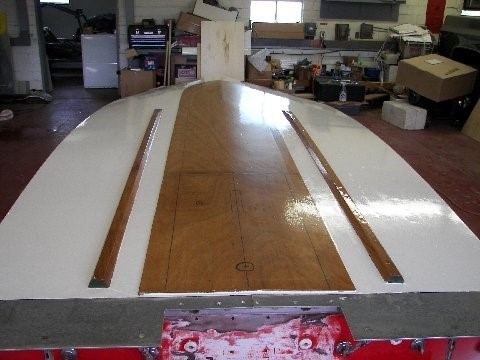 The only way to eliminate that problem is to fiberglass the planking first and then go back and do the keel second. Tomorrow I will start gluing it down with a layer of epoxy resin. It’s best to put the epoxy on when it’s not too cool out and with low humidity which is not a problem for me because I have a heater in my garage. Epoxy is a two part system consisting of the resin and a hardener. The length of time it takes to set up can be extended by using a slow hardener so that is the route I took. The “pot life” or amount of time you can work with the resin depends on the temperature in the work area plus the hardener you use. Even with a heater in my garage the temperature was hovering around 65 degrees while I was doing this and with the slow hardener I could easily mix and spread a cup of epoxy onto the glass cloth saturating a section then moving on to the next before the previous area had started to set up. 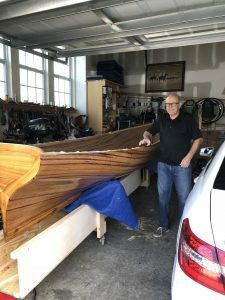 In this way I was able to do one side of the boat in about thirty minutes by pouring on a little epoxy then, by using a plastic spreader, I would move it around until I had an even coat and the cloth disappeared. 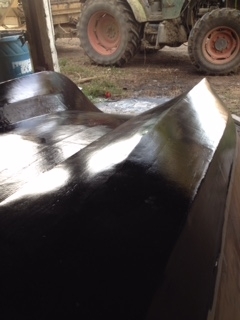 In this picture you can see how the nearly opaque fiberglass becomes transparent as the cloth is saturated with resin. However, after one coat the weave of the cloth will still be visible so you will need a few more coats. Try to keep it smooth and even while minding the way the cloth is getting pushed around. Here’s how it looked after one coat and you can see I chose to leave the cloth a little oversized and trimmed it back later. The Whitehall is beginning to shine after two coats of resin and the weave of the cloth is nearly gone. Here we are after four coats of resin. Between coats, the resin needs to cure enough so that the surface is not too tacky but not so dry that you need to sand again. If you apply the next coat before it dries completely you will achieve a chemical bond but if it becomes too hard then you must sand and go with a physical bond. I was able to get a chemical bond between all coats. 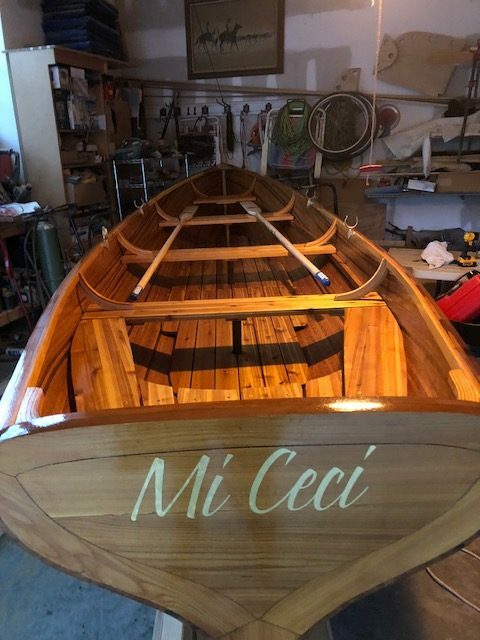 We need a coat of Varnish! After two weeks of curing the Whitehall has four coats of epoxy over fiberglass cloth and is looking pretty good but it’s not finished yet. Even though the weave of the glass cloth was almost gone after two coats there is a reason why we continued to add the additional two coats of epoxy, the surface was not ready for varnish and will need some attention before we can get a nice glossy finish. 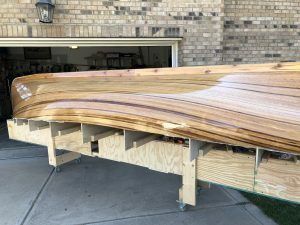 The slow hardener combined with the cool temperatures sure helped to maintain a wet edge as I applied one batch of epoxy after another but it also meant I would have some runs to fix. That’s where this handy tool comes in. This is a cabinet maker’s tool called a scraper and it’s made from spring steel. It comes with a very sharp edge that can be used to scrape off runs without damaging the flat surface. In a very short time I had all the runs removed from the boat. 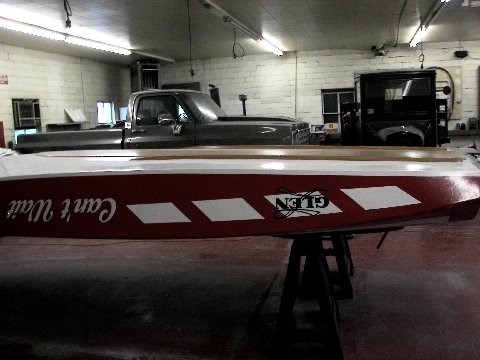 Here is a picture of the boat after scraping it. It’s looking pretty rough after scraping and with some sanding the surface will become dull again but smooth! Before sanding the hull I washed it in the driveway with soap and water to start with a clean surface. 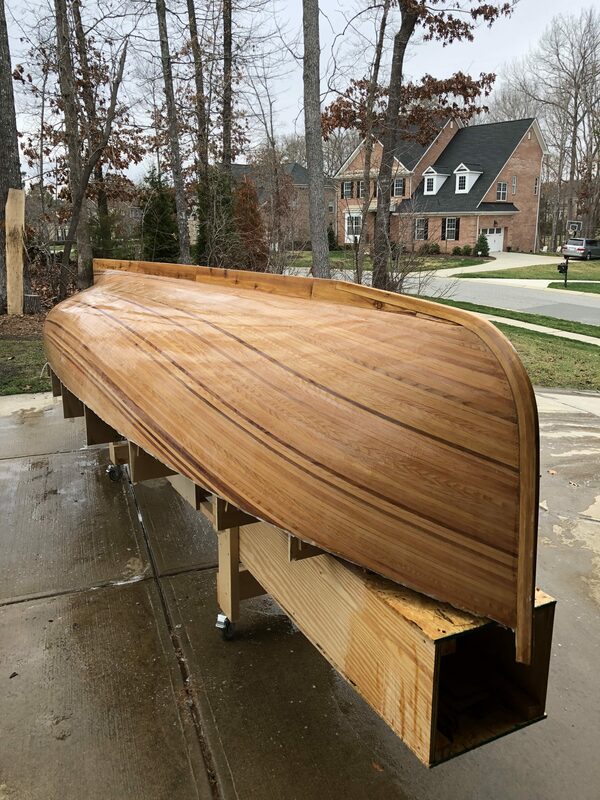 Then I rolled it back into the garage and spent the next few days sanding the hull smooth with 120 grit paper then switched to 220 and finally wet sanded out in the driveway again with 320. We are now ready to varnish! The day before varnishing I washed it out in the driveway to give it one last check to see if there were any areas that needed attention and everything looked good. After a couple coats of varnish the shine started coming back. I let it cure for a day and lightly sanded by hand between each coat. 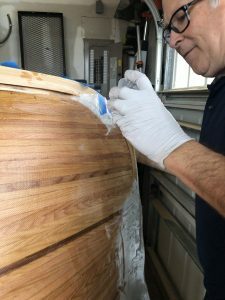 I used a foam roller to apply a thin coat of varnish and then after a section was covered I tipped it with an almost dry brush to smooth it out. This method works pretty well. 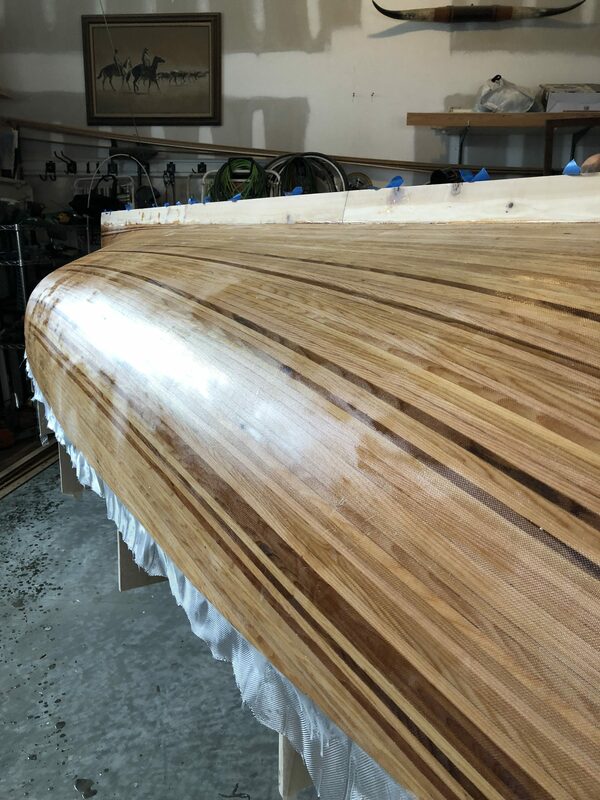 After all that scraping and sanding it was a relief to see the shine come back better than ever and now the epoxy layers underneath will be protected from UV rays. Time to flip it over and get to work on the interior! Today I removed all the screws holding the molds to the strong back and my son and I lifted the boat off and set it down on some moving blankets. 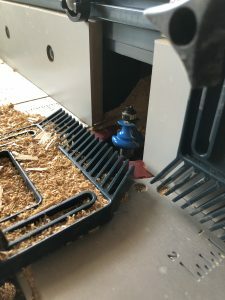 The picture above is after the mold halves have been removed and as you can see, it was necessary to use a hammer to get everything out of the interior. (Leave the floorboard supports of course). I had to remove the top of the strong back and made some supports for the bottom of the boat by utilizing the forms obtained from the full sized Glen-L plans. 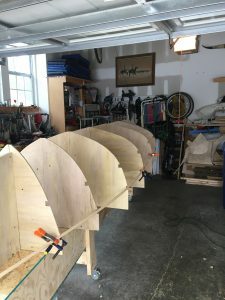 I found the corresponding mold station forms and traced them onto new 3/4″ plywood then cut them out to leave a cavity that the boat would rest on perfectly. I added a moving blanket to make sure that nothing gets scratched. Now I’m ready to start on the interior. 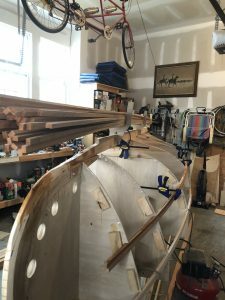 Now that the boat is upright it’s time to figure out the interior. We will need four thwarts, (which will be the seats), a rear bench, a bow breasthook, ten knees and floorboards. 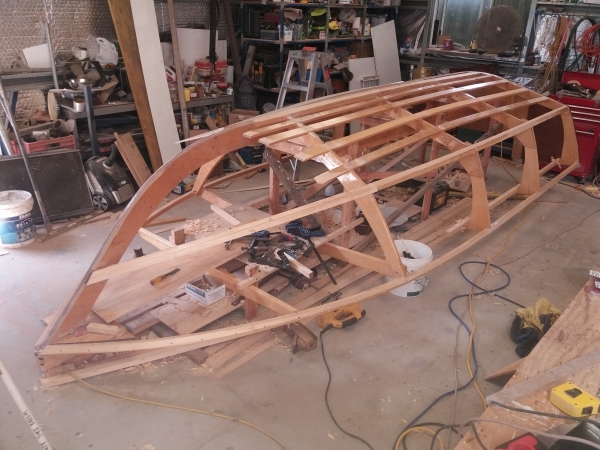 My plan is to fabricate and fit into place temporarily, every part I need for the interior on this boat. Once that is done I will take it all apart and finish each part individually and have them ready like a kit. This should result in a nice looking interior. 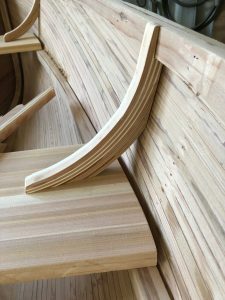 I decided to use laminated thwarts and in the picture above you can see some of the cedar boards cut for the four seats. After I cleared out the leftover debris from the destroyed station molds I was happy to see that the interior surface of the boat was pretty smooth already and would only need minimal sanding. 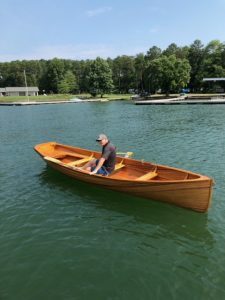 The breasthook and the knees are made using the form patterns in the Glen-L plans but you will need to custom fit them to the contours of your boat. In order to eliminate a lot of trial and error cutting I made some templates from the work by taking a few scraps of wood, setting them in place with a drop of glue at the joint and letting it dry. In the next post we’ll see how the breasthook and knees are made. In a previous post I showed how the knees are laminated and today I’ll show how I shaped them to custom fit my boat. 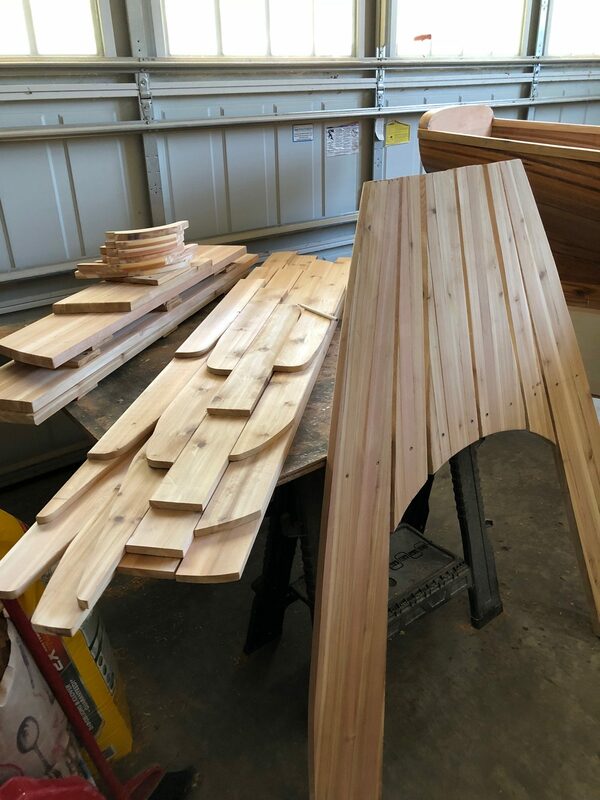 As I mentioned in a previous post, I made some templates from the boat itself so I could eliminate a lot of trial and error cutting and sanding. 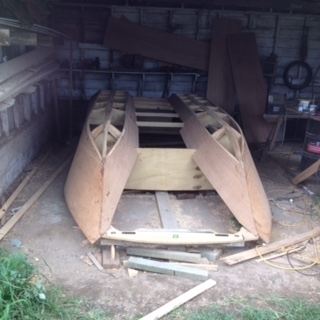 In the picture above I’ve got my template on top of one of the knee laminations to get it ready to trim for the boat. Here is the stern knee clamped in place to check for fit. 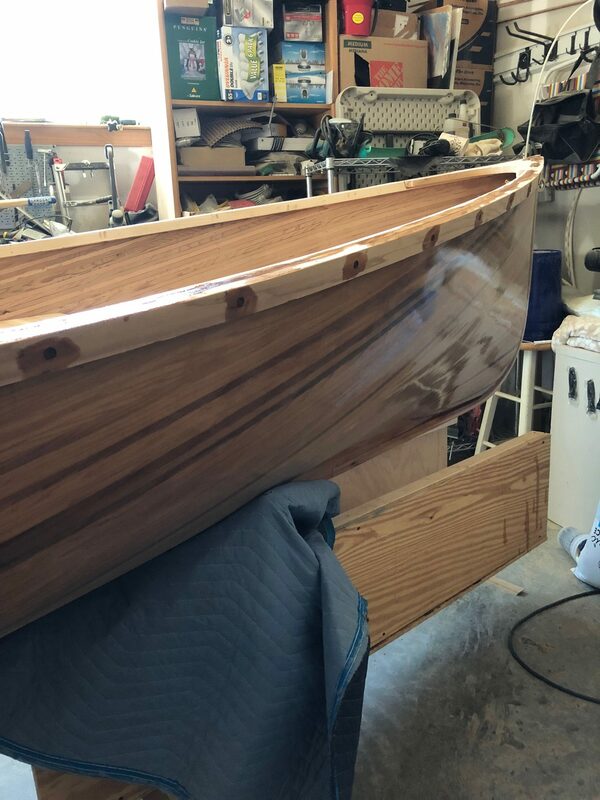 I don’t want to finish it yet until after I have the stern bench finished and can get my wife to sit there and make sure it’s comfortable. In the pic above you can see what the thwart knee looks like after first using a template to get the general shape then trial and error fitting. Once I had one that fit perfectly I used it to quickly make its duplicate for the other side. Here’s how it looks mocked in place. By the way, I made the knees out of red cedar and I tried to alternate the colors so that I got this striped effect. I hope it looks good once it’s epoxied and varnished! 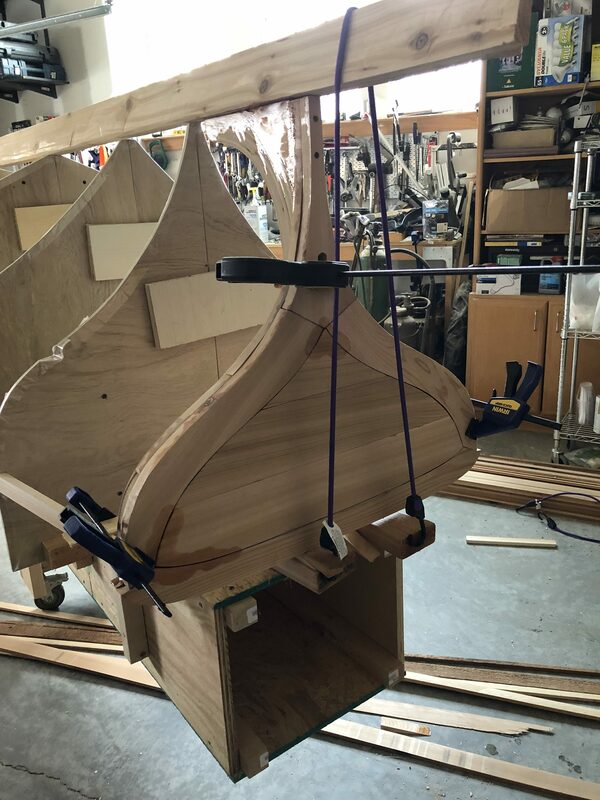 The rear bench starts with a support for the front of the seat and a brace will also need to be added between the risers at the stern. I used the Glen-L full size drawings for the station mold closest to that brace to get the correct contour for the hull. I took the lid from a barbecue and traced the radius onto the bottom of the brace to give it a little style. The bench needed several laminated parts that would end up being cut into a “fan” shape to make up the stern bench for my Whitehall. 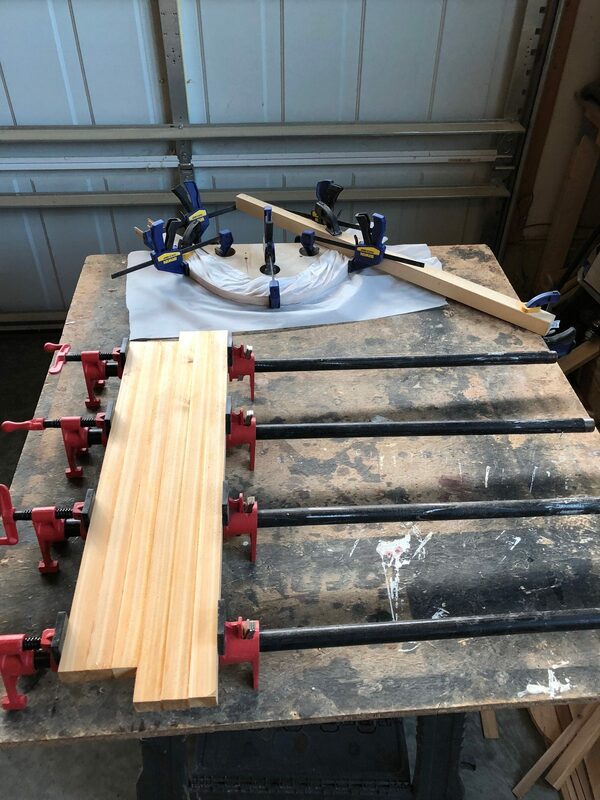 I started with cedar blocks cut and planed smooth then clamped them together utilizing pipe clamps until the glue dried. I ended up with several pieces like the one above. I placed one of these on two bricks then jumped on it to test it for strength. GOOD! 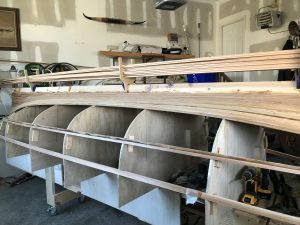 The stern bench has a large radius cut into the seat and I made that by temporarily attaching the seat planks before scribing a large radius using a divider I found in an antique shop. 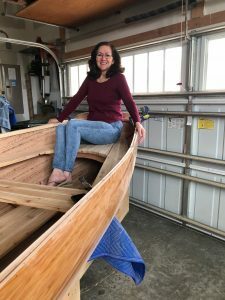 After I cut the radius I asked my wife to sit in the boat to make sure it’s comfortable. 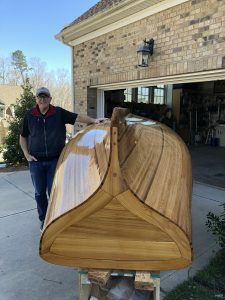 She said it felt great and I was impressed with how strong this boat is. 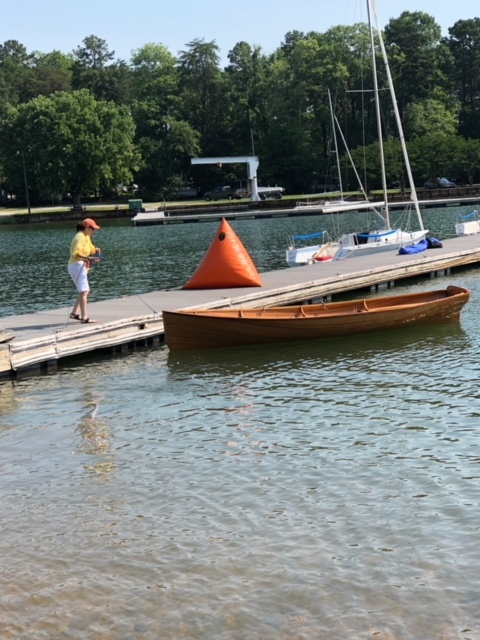 I was expecting to hear a few noises from the boat since the stern bench was cantilevered out from where the boat was being supported but there was nothing. There was not a squeak or a groan and it didn’t budge a fraction of an inch. This design is SOLID! In this picture you can see the way the seats will look. 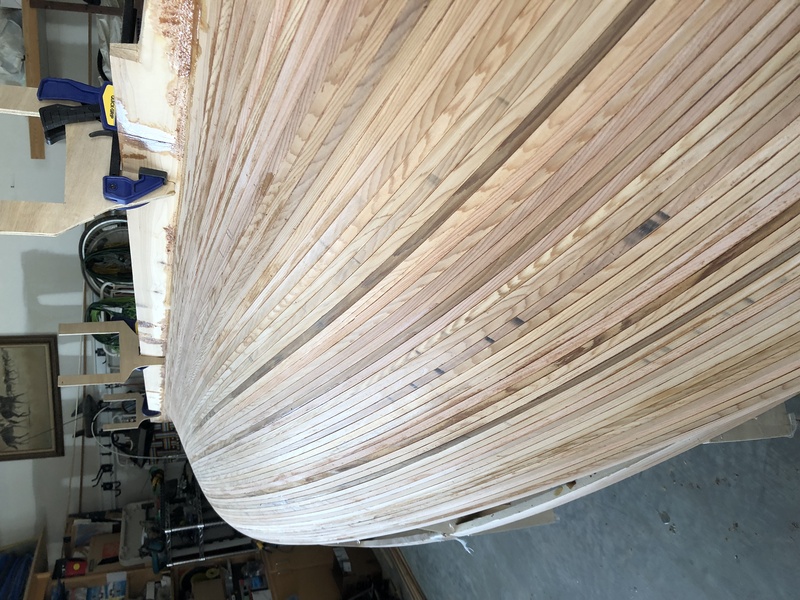 It’s starting to look like a boat! And as you can see I’ve already started on the floorboards. 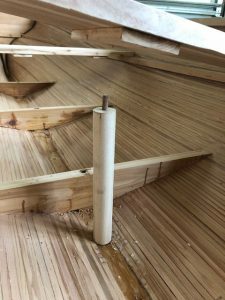 The rub rail runs along the length of the boat from stem to stern on the outside of the planking and along with the inner sheer, sandwiches the planking to make a nice sturdy rail. I was hesitant to dive into this part of the job because the rail was a fairly stiff piece of wood. 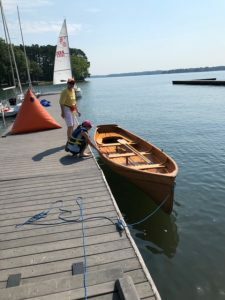 It not only needed to follow the curve of the boat but also had to start high at the bow then dip to the middle and then curve back up again to the stern. However, with enough clamps, anything can be done! I made a test fit by clamping the rails to the boat then I marked the ends for cuts plus made an alignment mark in the middle so I could easily duplicate the placement again. 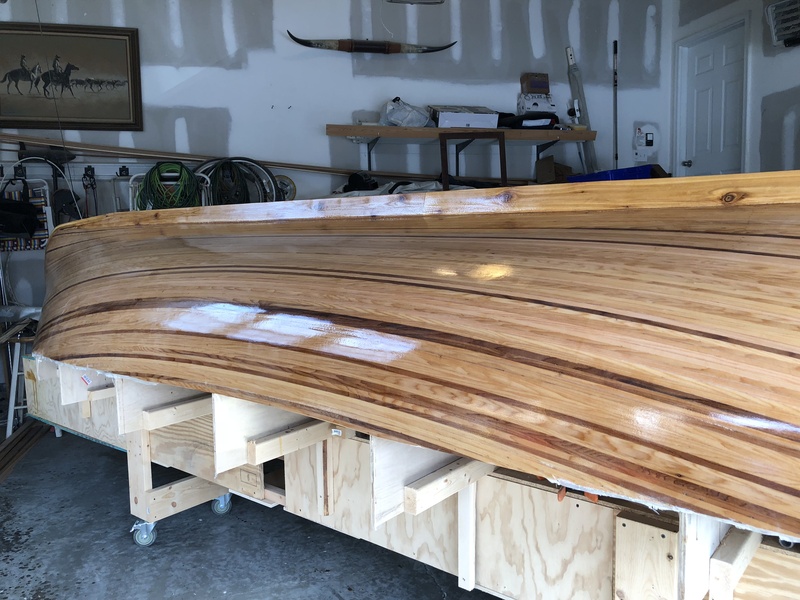 Once my cuts were made I roughed up the area where it would glue to the hull and applied a layer of epoxy and clamped it up again. 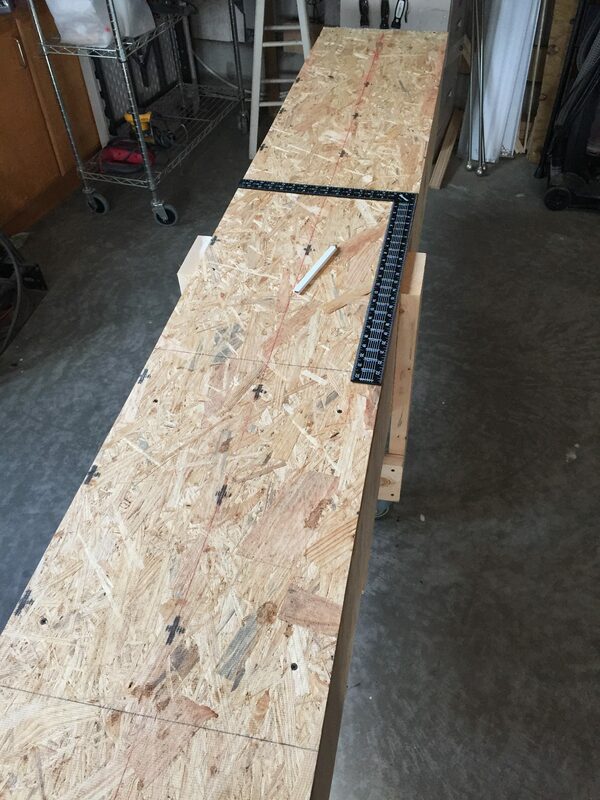 Once it was back in place with glue, I drilled a pilot hole every six inches and put a countersink on each hole. Then I screwed through to the planking and inner shear for a nice tight fit. 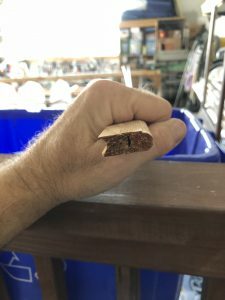 The next day I mixed up another batch of epoxy with cedar wood flour until it was the consistency of peanut butter (but looked more like Fig Newton filling) and filled all the holes flush with the rail. I also added a bronze bow eye for the painter line by drilling through the stem and bolting it on from the back side. Check it out below. Part 23: Thwart Supports and Clearance Clarence! Before I could finish the floorboards I needed to put some supports under the thwarts. 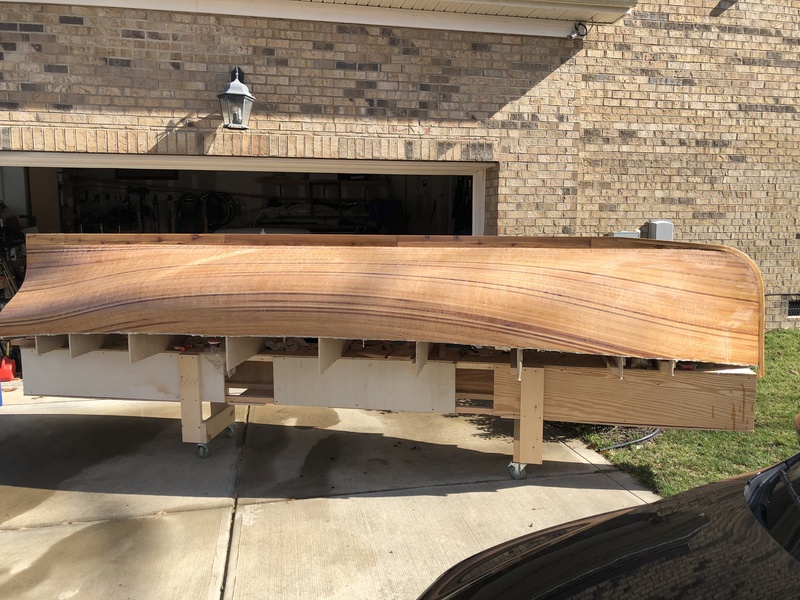 I don’t have too many pictures of that part but it basically entailed transferring some measurements from the placement of the seats (thwarts) down to the keel. 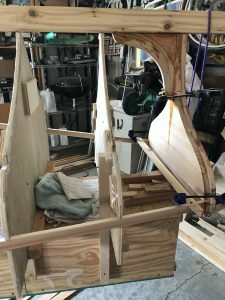 Then I drilled for a dowel at the keel and the bottom of the seat and mounted three 1 1/2″ round poplar rods which I will stain a darker color than the cedar. Once the supports were in place I decided I didn’t like the look of the big gap in the floorboards so I measured the central floorboards and set up the jig below to get a nice round hole that would also leave an aesthetic space between the boards and the hole around the dowel support. Check out my jig set up below. 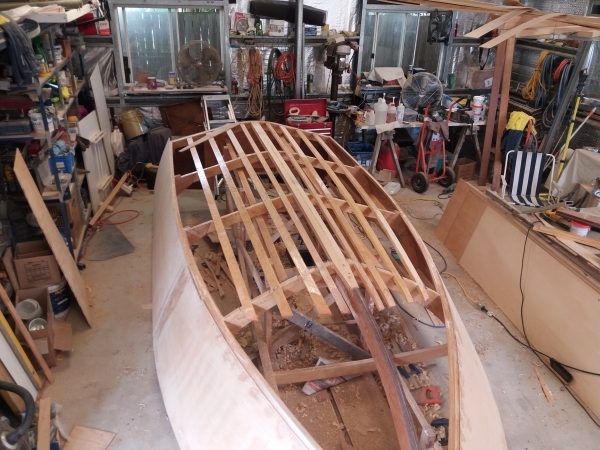 As you can see I marked where I wanted the hole and placed my two central floorboards on either side of a spare piece of planking I had left over from stripping the boat. Then I cut it out with a hole saw. Here they are temporarily set up around the supports to check for fit. 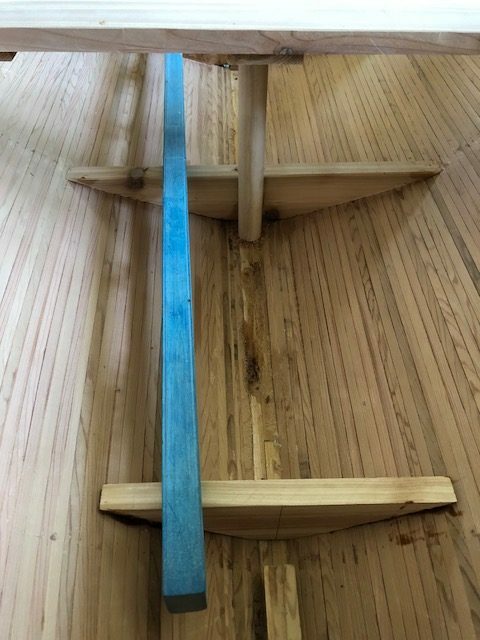 You could just use long one piece floorboards for your boat but then it would be difficult to remove them for inspection at a later date without also removing the thwarts so I made my floorboards meet up at one of the floor timbers which I made extra wide for this purpose. Here they are just set in place to have a look below. Before starting on the interior epoxy and varnish I decided to do one last thing. I extended my floorboards a bit so I needed to make a couple of extra floor timbers to support them. The Glen-L plans suggest that some extra supports be made at the end of the floorboards but they don’t specify how to do it. I took a look at the plans and realized I could get the necessary contours to add two extra supports by using the closest station forms as a start. 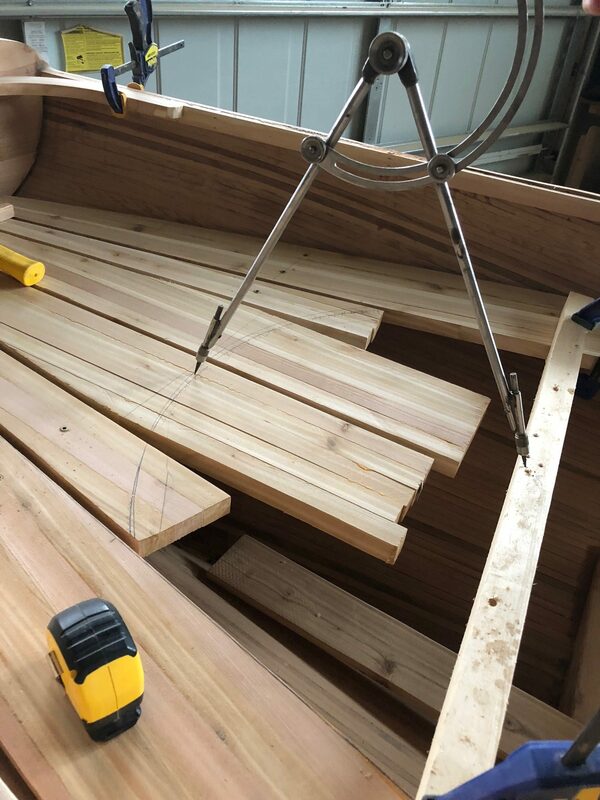 After finding the nearest forms I traced them onto some cedar scraps and then hand profiled them until I had a nice fit that was level with the other floor timbers. Check it out above. 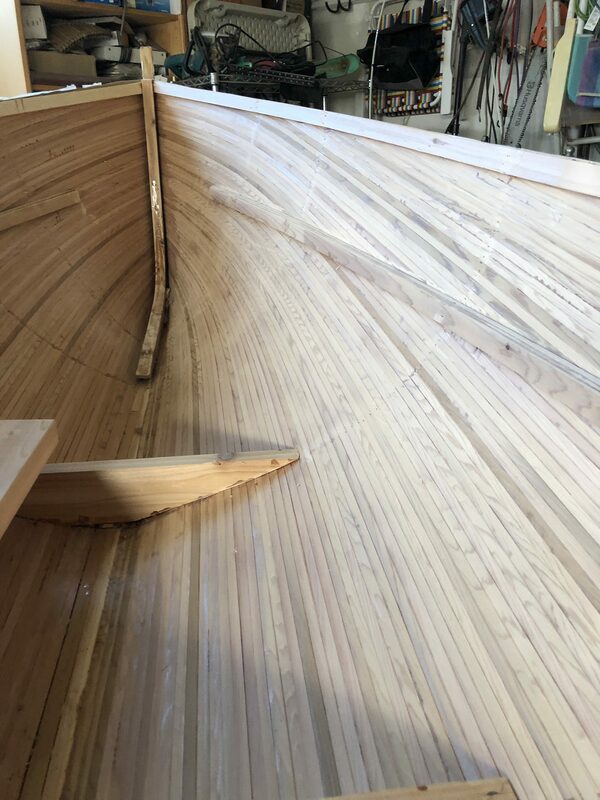 In the picture above I have the entire interior of the boat stacked up and ready to finish. It may be a few days before I have an update because of the many coats of epoxy and varnish necessary for a hard durable finish but hopefully it will all be worth it! I named it after my wife. Here it is rolled outside to get a look at it. I’ll post some pics of it in the water next week. 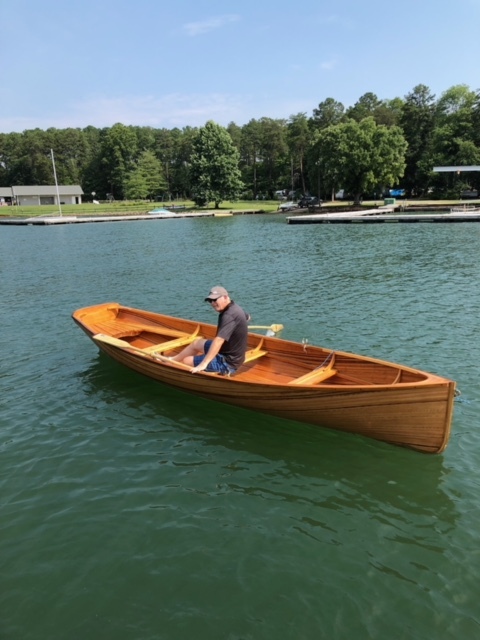 We trailered the Whitehall over to Lake Norman near Charlotte NC for the maiden voyage. I’m happy to report all went well and it was much quicker than I was expecting! I was used to rowing fishing boats on Irvine Lake in Southern California and they would move one boat length with each pull of the oars then stop. 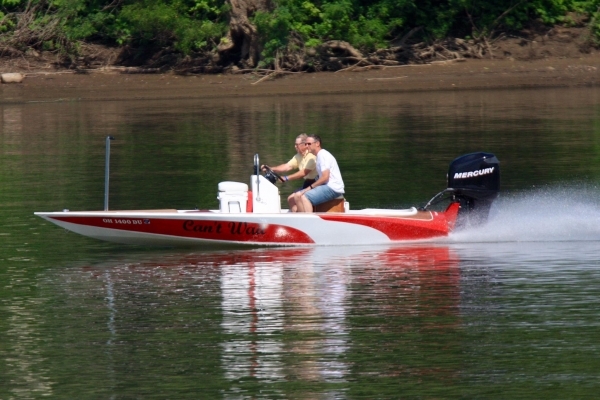 This boat gets up to full speed after about four pulls and will glide for a hundred feet easily before coming to a stop. It was fantastic! My granddaughter is guiding me past obstacles. My wife was in charge of the painter line and helping guide the boat back onto the trailer. Thanks for posting each step, I look forward to seeing it all completed. You’re welcome Pat! I plan on posting a new step each day until I’m caught up and then as I progress through this build. I’m working on the seats and bracing now. Hey, Go for it bud! I look forward to every installment. Thanks Dan, It’s been a lot of fun so far. I think I’ll be done in about 5 weeks.